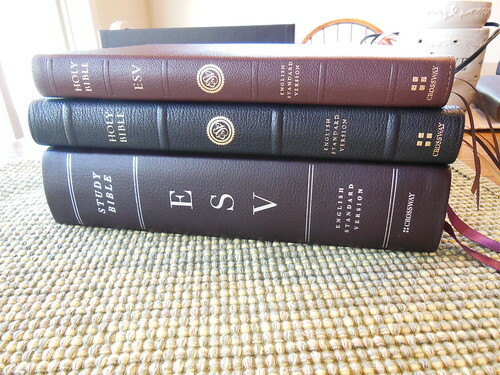 I received this set from Crossway some time ago, and wanted to use it for a while before writing a review. This review will differ from my others in the lack of a listing of the physical attributes like, paper weight, cover material, binding, font size, and layout, as all of that information and more can be found here. 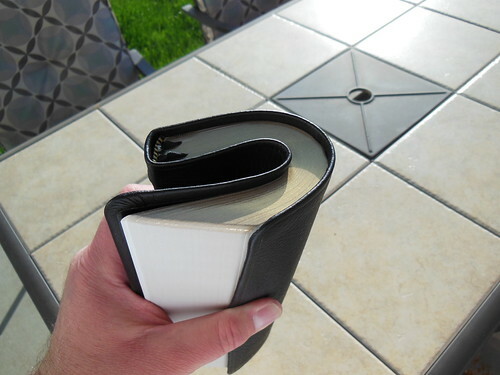 The Reader’s Bible is unlike any other Bible I’ve reviewed. This one is a six volume set, intended for undistracted reading. 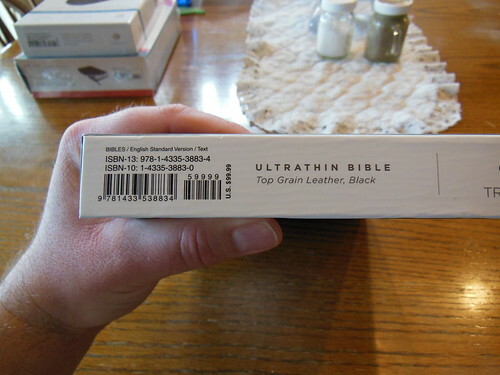 That is not to say that other Bibles aren’t for reading. It is to say, that the focus of the layout, and construction was to be conducive to reading. This is necessarily at the exclusion of other purposes. For instance, study, easy reference, citation, and so on, as there are no chapter or verse numbers, no footnotes or cross references. There is a chapter index in the back of each volume. For older folks like myself, it is so different from Bibles we’ve used for such a long time, that it takes some getting used to. It isn’t a bad experience, just different. I am a slow reader, and tend to study as I go. 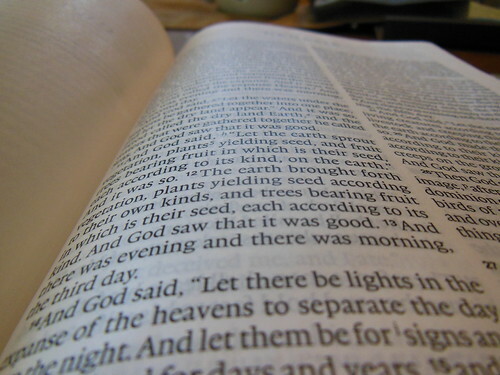 Other people can speed through the Bible, and retain information. When I simply read the Bible, I have to remain very conscious of what I am reading, and be diligent to properly regard it. When I start to read sometimes I start to drift. I find myself going back over the same section a few times, to make certain I have understood what I’ve read. 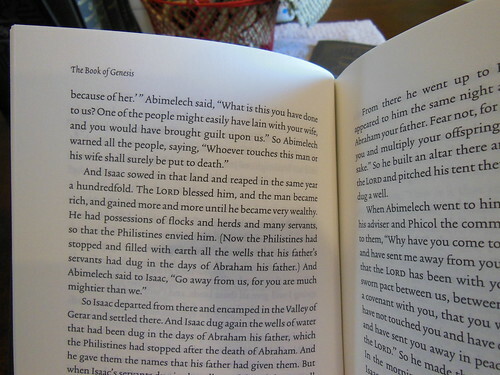 With the Reader’s set, you can read without getting side-tracked by interesting cross references, or footnotes. 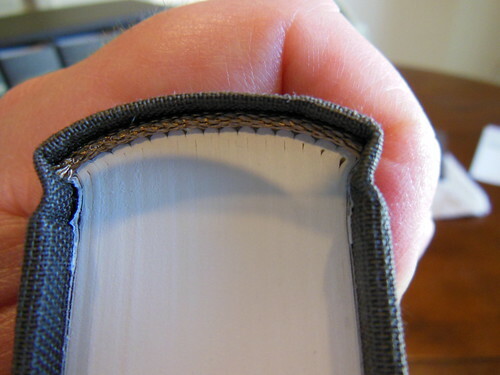 The first thing you notice is the volumes are constructed as a quality hardback, cloth covered book. 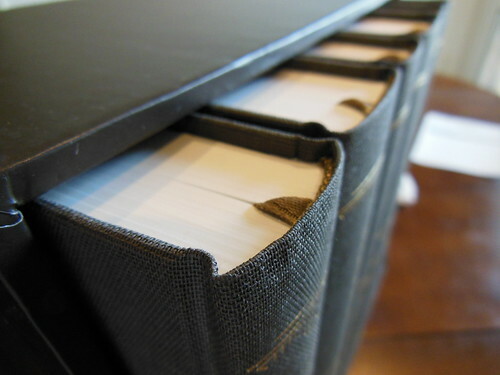 Each volume has a marker ribbon, sewn spine, heavy paper, and easy to read font. Then while reading you start to experience what Crossway intended. 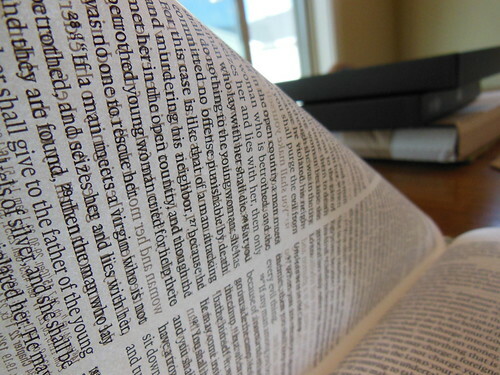 You have a smooth progression through large sections of scripture. 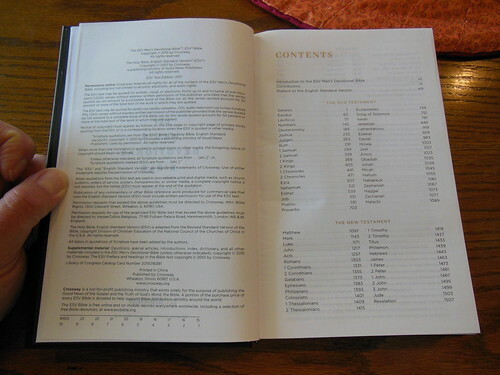 As you read, you don’t make your decision on where to stop by chapter numbers, or section headings. Instead, you stop where it seems natural, usually at the end of an idea. As you read, you’ll also notice that your eyes don’t tire as easily due to the very thick paper, and font. (For all the stats follow the link in the first paragraph of the review.) With the longer sessions, you tend to cover more ground. 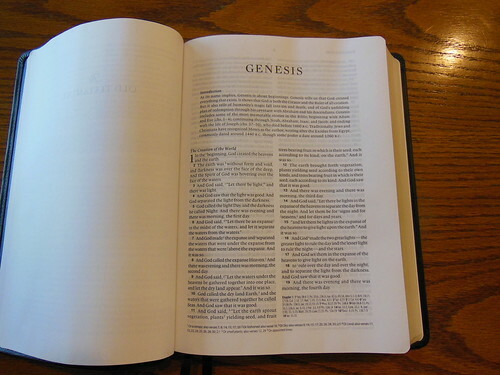 I would not let my reading, exclude separate study of the Bible. Having the Reader’s Set does force you to make time for reading, and study. I think I need that in my daily routine. Separating the two activities does seem beneficial. I think this set should hold up well, as long as they are cared for properly. 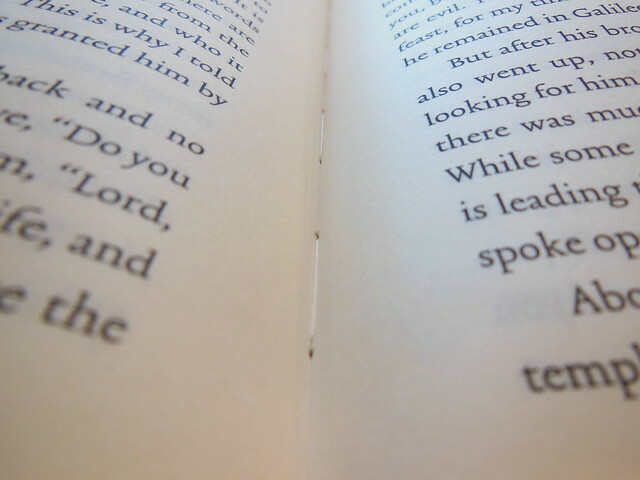 I would be careful around moisture, as the pages are not coated, and would absorb water, finger oil, and dirt readily. Which brings me to my next suggestion, don’t eat, drink coffee, or have dirty hands when reading this set. 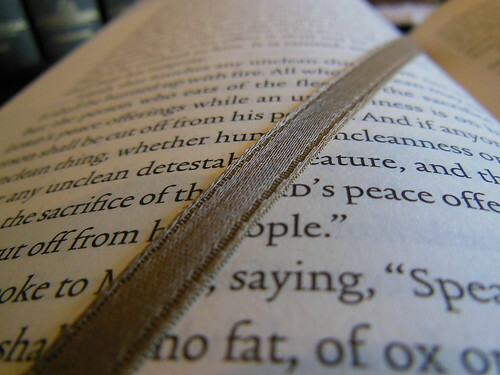 You will stain the cover, mess up the pages, and make it look messy. 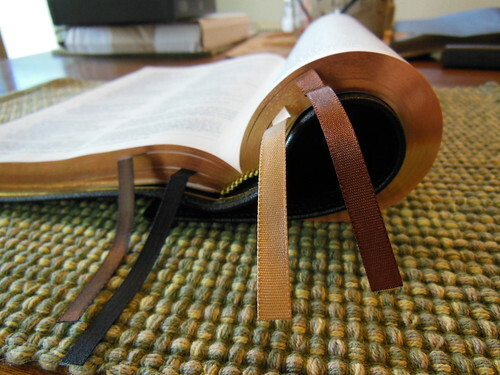 My final thought, is that they are nice to have when you want to sit and read God’s word. My eyes aren’t what they used to be, and even though the font isn’t large, it is easier to read. I like the feel of them. It is an awful lot like reading a hardback novel in certain ways. You can view Crossway’s product page here. You can also read more about this specific sets production here. Be sure to check out the rest of the pictures on my flikr page. 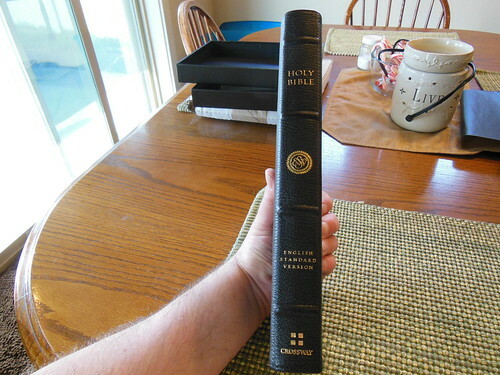 I am giving away a hardcover edition of this Bible. 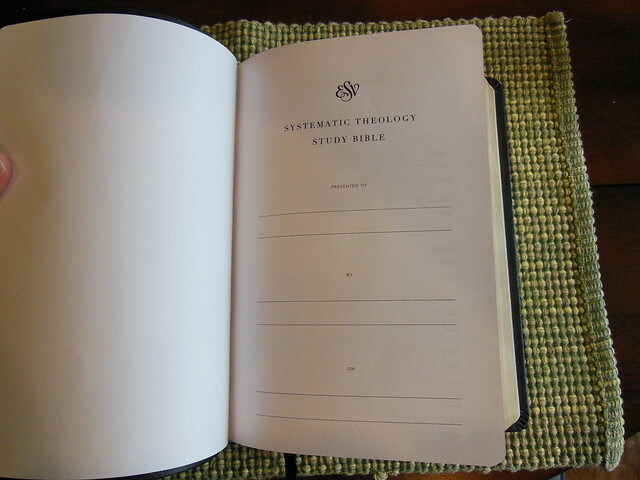 The Systematic Theology Study Bible from Crossway, is a different kind of Study Bible. 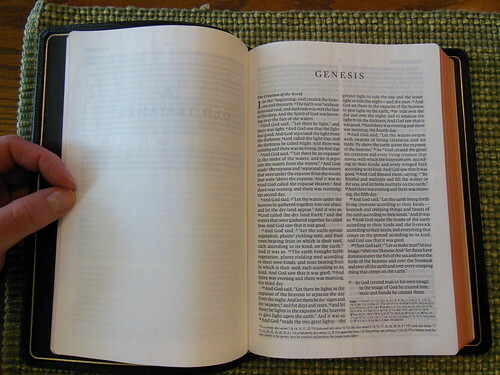 It isn’t really accurate to call it a reference Bible, or a Study Bible. 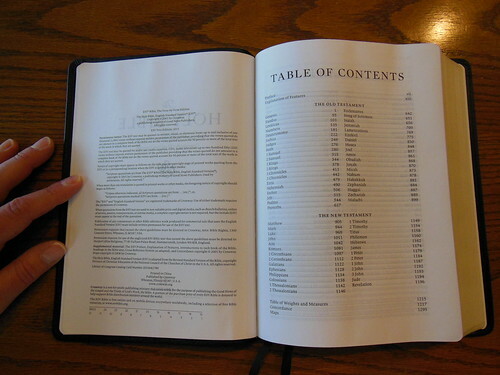 It is technically a study Bible in the sense that it has study aids in it, but it looks more like a reference Bible with a systematic theology book blended in with it. For my conservative paedobaptist friends, you’ll notice the notes seem to be in favor of credobaptism. 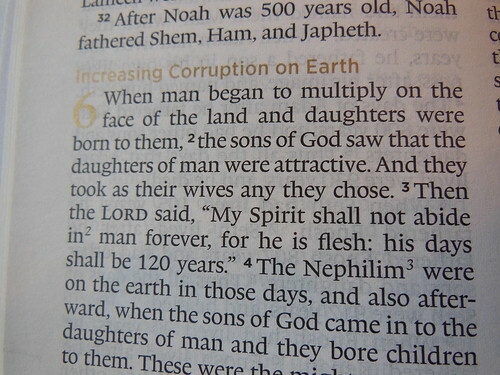 For my friends who don’t believe in God’s sovereign election, you’ll notice the notes don’t agree with you. 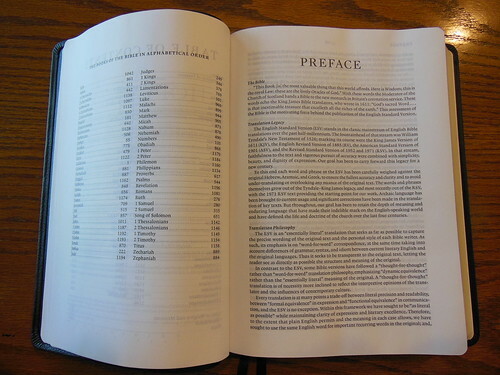 Some people would like it if a broad range of theologians worked on this Bible, but they didn’t 🙂 It was mostly Reformed Baptists, and conservative Presbyterians, from what I gathered reading the list of men involved with writing the theology articles. The systematic theology seems to lean towards a general Reformed position, which is good, because… well, I think it is the right position lol. 🙂 I think any person who affirms the reformed position on soteriology will be appreciative of this Bible and the articles in it. It is broad in appeal to people who are reformed. It might not get all of your more nuanced secondary, or tertiary doctrines just the way you want them, but we will all be in accord over the treatment of the primary ones. I can definitely see the Reformed Baptist position reflected in the work. 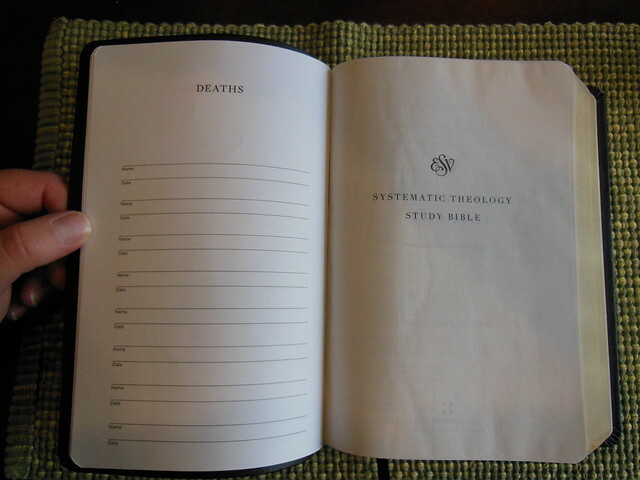 When we look at most study Bibles they either are one man’s theology, like the Ryrie, Scofield, and MacArthur, or they are a compilation of a wide range of theologies like the massive ESV, NIV, Thomas Nelson NKJV study Bibles. The last three are humongous study Bibles with a little bit of everything. 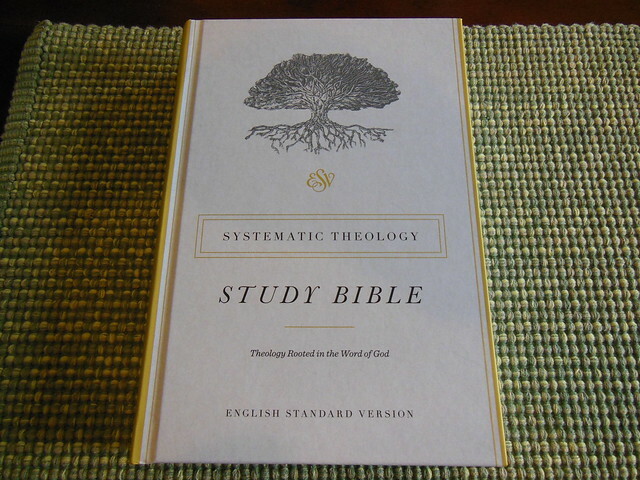 The Systematic Theology Study Bible is a neat hybrid. It isn’t one man’s theology, or a broad, neither here nor there conglomeration of positions. (Excluding the ESV which does a great job.) It is from the reformed position. 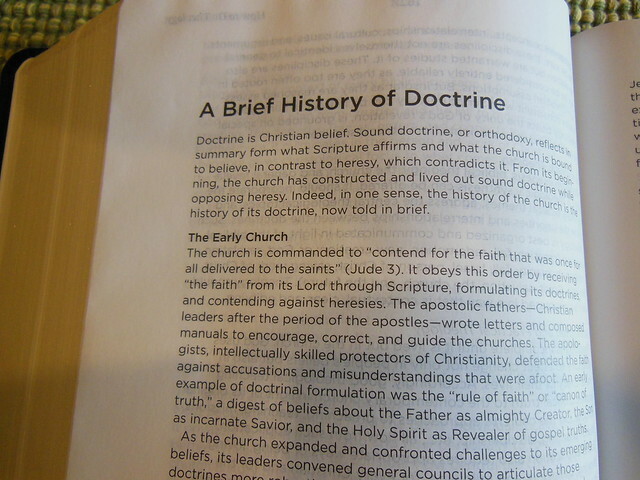 The theology is systematic, which means that it is harmonized. Verses are not put against verses. They are all contextually harmonious. 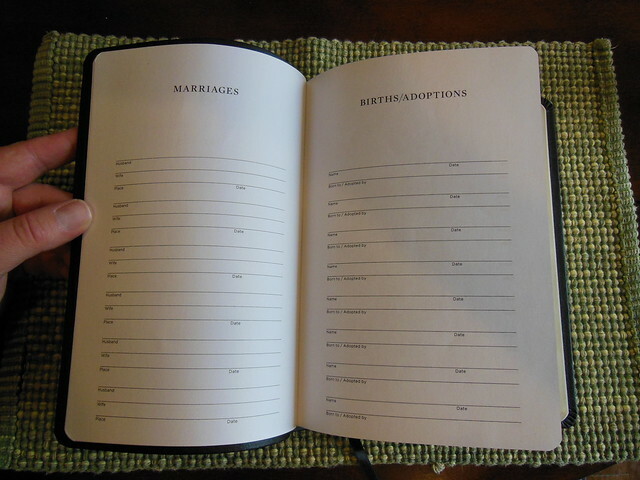 You’ll find book introductions and outlines before each book. You’ll also notice that the Bible looks a lot like a Cross Reference Bible. 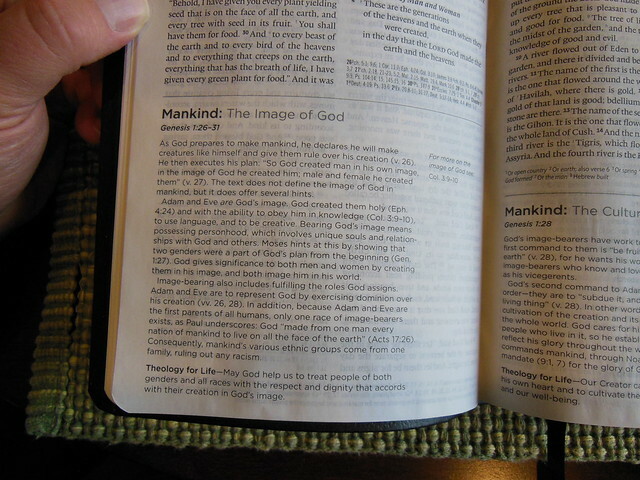 It seems to me that Crossway integrated their systematic theology features into the Bible very well. The articles are relevant to the scriptures they appear with, and are indexed in the back along with several theological articles. 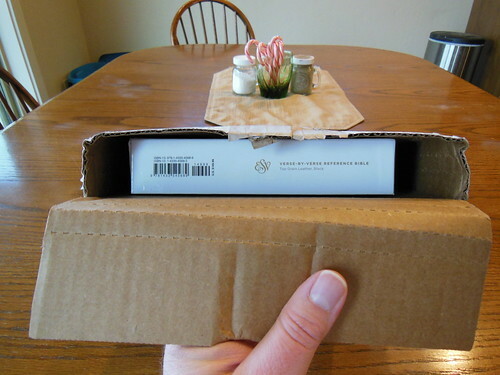 This Crossway Bible was packaged well and delivered in a cardboard box. 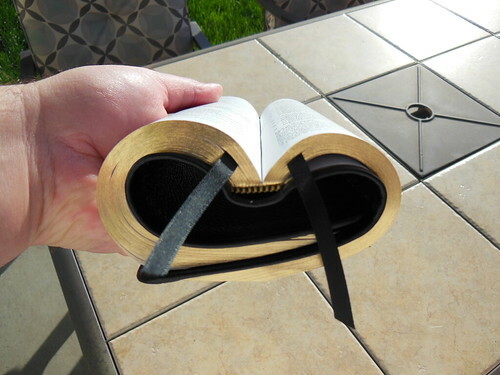 The Bible was in a two piece retail box. You should always keep the retail boxes for storing your Bibles in if you are swapping it out with another one to read for a while. 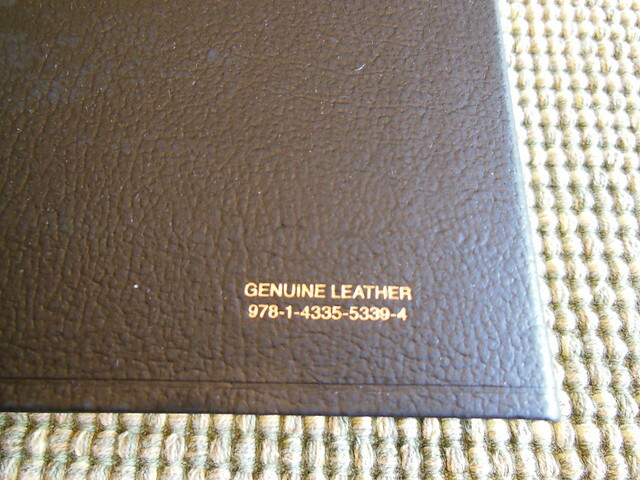 The cover is black genuine leather with a perimeter groove. 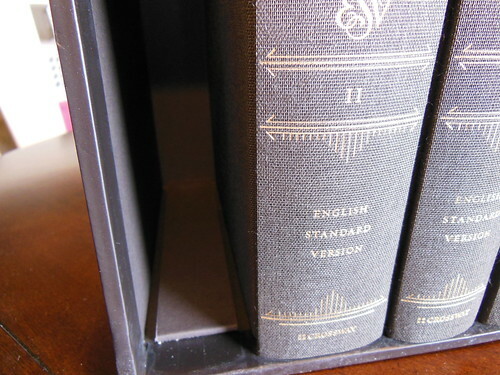 The spine is decorated with the ESV logo at the top, then, “Systematic Theology Study Bible.” English Standard Version at the bottom, with Crossway’s logo hot stamped in gold colored foil. 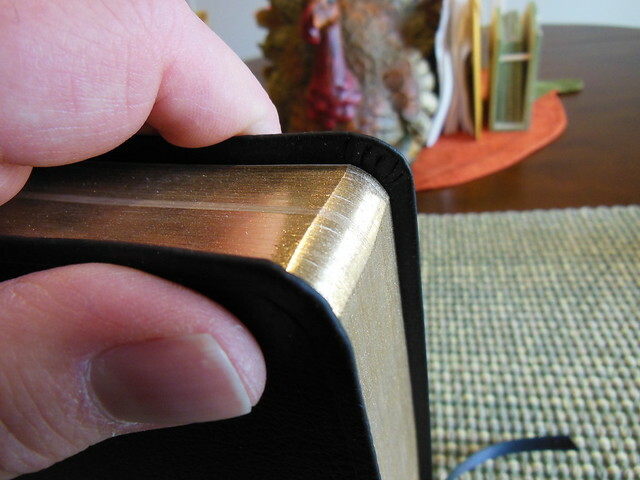 The page edges are also gold gilt. There are yellow and black, head and tail bands, and one black ribbon marker. 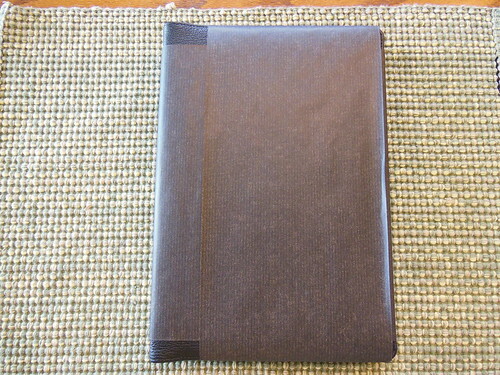 The cover is joined to the text block via case binding. 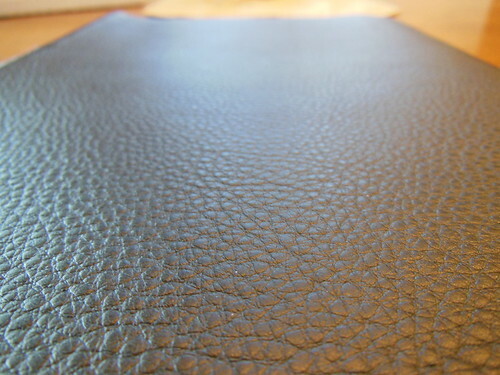 The spine is sewn for superior flexibility, and durability. 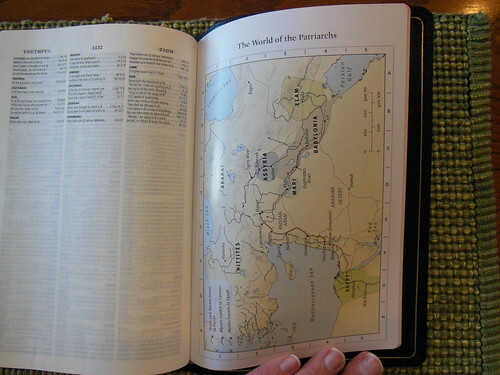 In the front of the Bible there is a presentation page, and some family records pages. 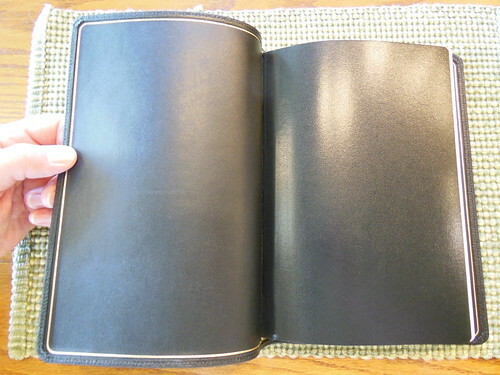 If you look at the copyright page, you’ll be pleased to see this edition was printed and bound in the United States. The book introductions are well done. I found them to be informative, and concise, but not to a fault. Cross references and footnotes, along with the systematic theology articles are found at the bottom of the page to save space. The text is laid out in a double column, paragraph format. The main font is an easy to read 9 pt. 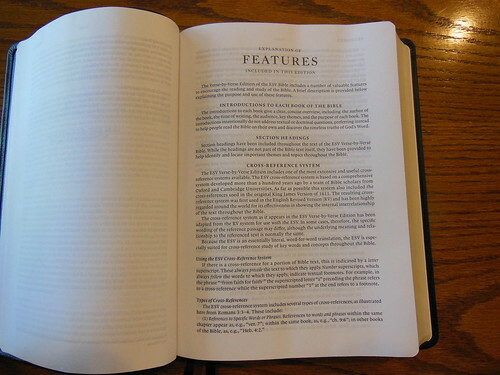 Lexicon, and the features are an 8 pt. Gotham, printed crisply on 30 g.s.m. 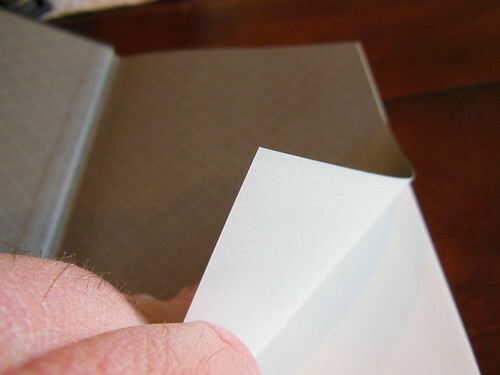 Apple Thin Opaque paper. The paper is smooth, and offers a decent contrast, and due to its color reduces eyestrain. If you don’t already own one of these, you should get one. 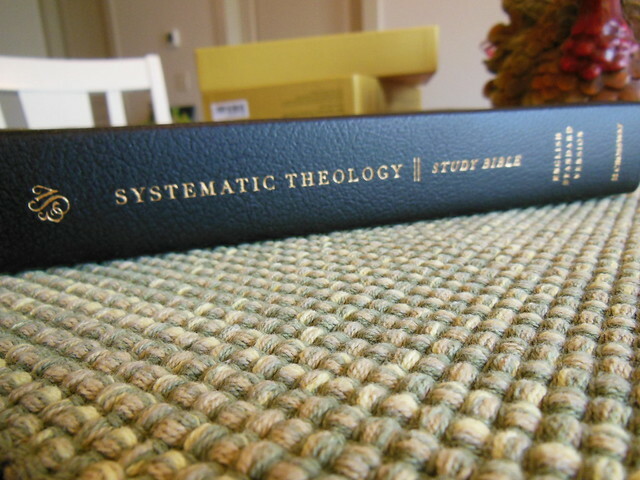 It is a times saver if you are intending to read a systematic theology book. You can kill two birds with one stone. It is available from Crossway, Amazon, or Christianbook for a very fair price. 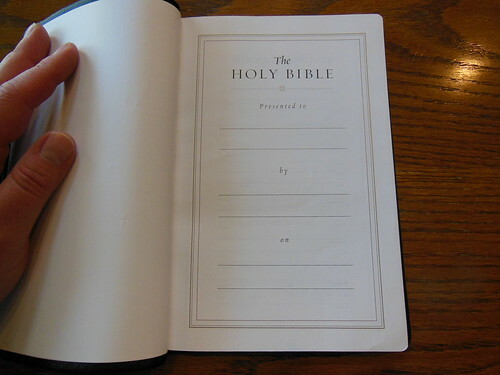 Since you stuck around for the entire review, if you comment on this review, and ask to be in the running for the hardback copy of this Bible I will select a winner out of those who commented. Be sure to check back so I can get your mailing address. I will only mail this to an address in the U.S. 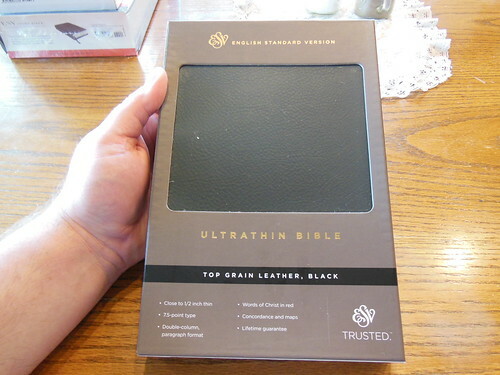 I know that not too many people are aware of the premium Bible market. 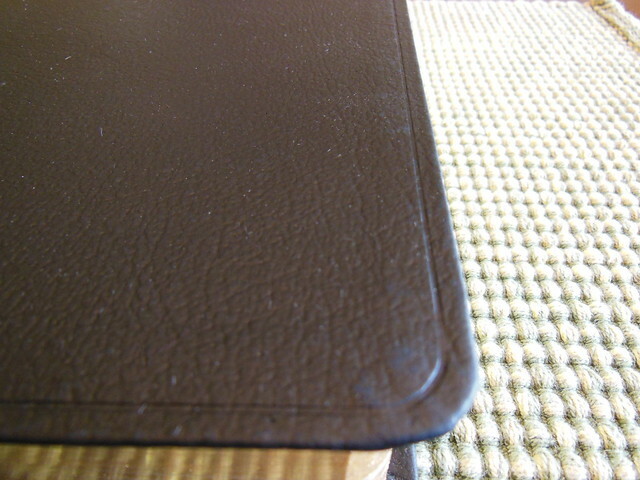 For those that are, they appreciate the natural hide, edge lined covers, sewn bindings, premium papers, and aesthetics. 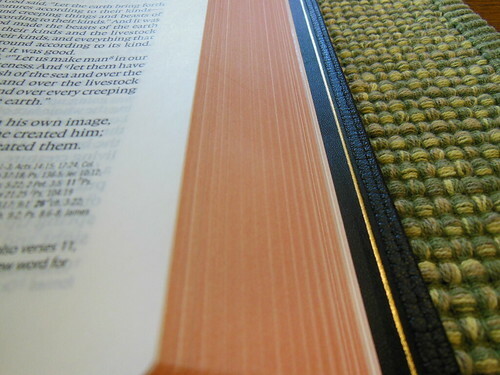 The price can be the main prohibitive factor for someone seeking to buy their first premium Bible. 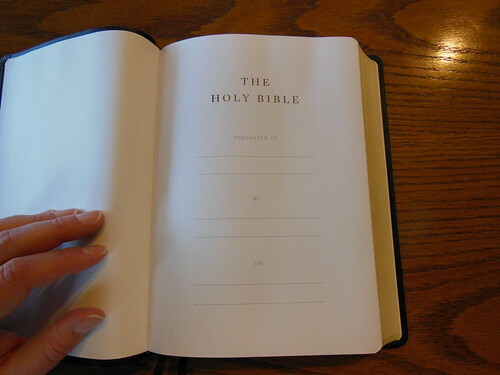 The Bibles in the premium category usually start out at $150 to $250 price range. The suggested retail price of this Bible is $250. 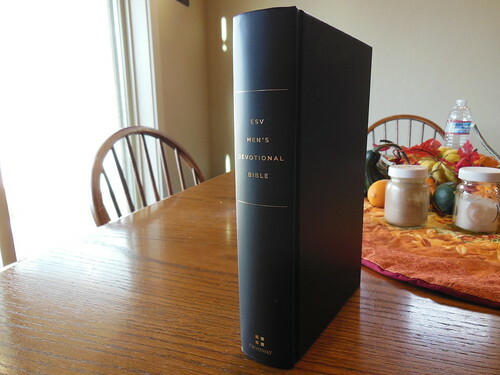 This Bible can be purchased from Christianbook.com for the dramatically discounted price of $169.99 and from evangelicalbible.com for even less at $149.99 Just let that sink in. 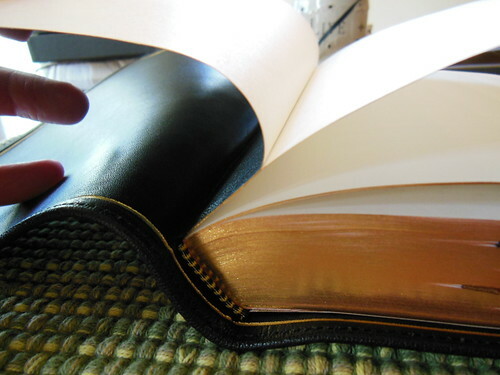 You can get one of the best quality, best translations, from Crossway printed and bound by Jongbloed, the premiere Bible bindery for the price of a concert ticket. 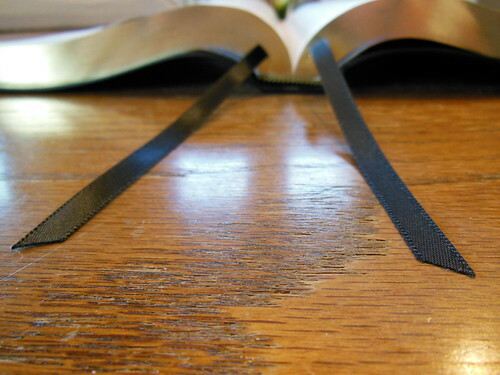 In the world of premium Bibles there isn’t much room for error or variance. 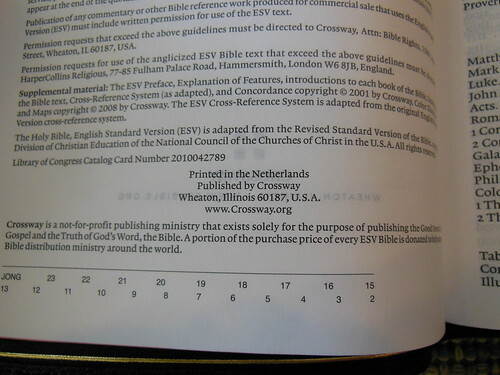 If you want to publish a premium Bible, you go to Jongbloed of the Netherlands. 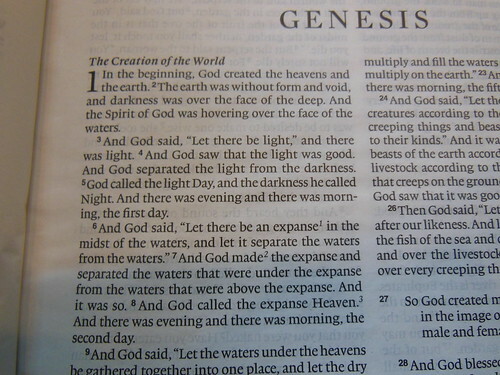 When Crossway wanted to publish the Omega, they didn’t skimp. They also went to Jongbloed. There are numerous reasons why publishers utilize them for their premium editions. Paper choices, cover choices, binding methods, printing equipment and methods, overall professionalism and standards, you get the idea. 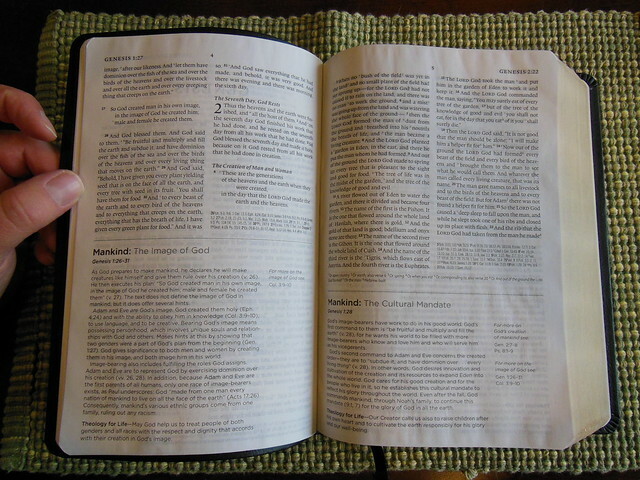 Cambridge, Schuyler, Allan, all have made use of Jongbloed for their top notch Bibles. The E.S.V. 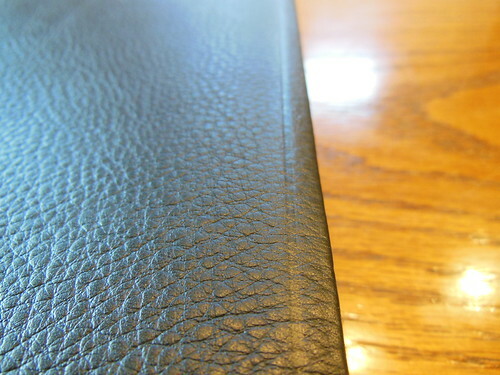 Omega Reference Bible in black, edge lined goatskin leather, is one of the best Bibles available today. It belongs in the premium Bible category. I could go on and on about the great qualities of this edition, but instead I think it would be better if I just show you. Without further delay, some high resolution pictures with comments. 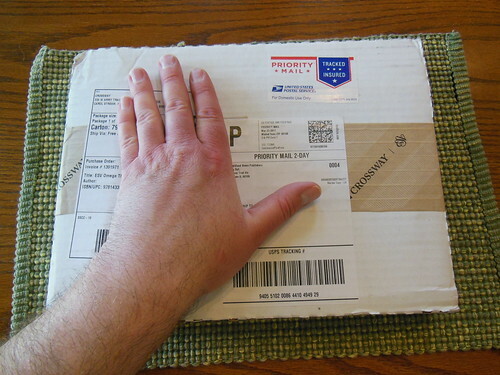 The Omega was shipped from Crossway in a white box. It arrived undamaged. 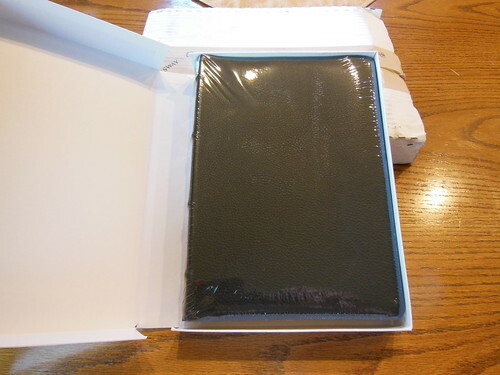 Inside the shipping package, was the Bible in it’s black, two piece, presentation box. Retain it for storage. 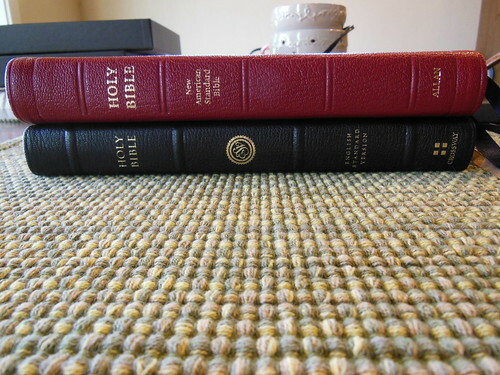 The Omega is too flexible as an edge lined Bible for you to stand it on a bookshelf without a box. 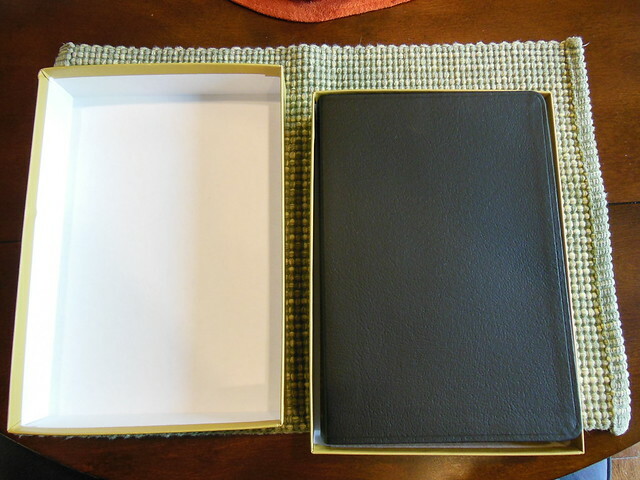 Inside the presentation box, the Omega is wrapped in two bands of paper to protect the page edges and keep it from shifting around during shipping. 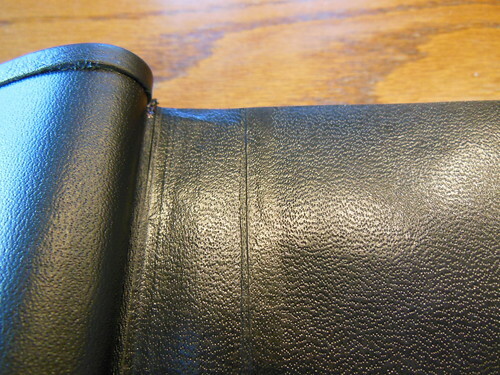 The black goatskin cover is perimeter stitched to the inner liner. It has a pleasing natural grain, and is very supple. 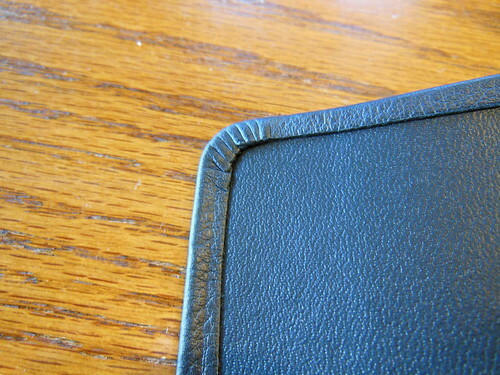 The inner cover/liner is also leather. 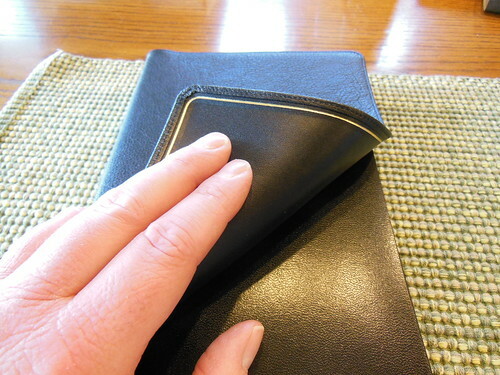 It has a gold perimeter line and the corners are finished well. The hinge will take a bit to break in, but once you do it will last a long time. The spine is smyth sewn and very flexible. 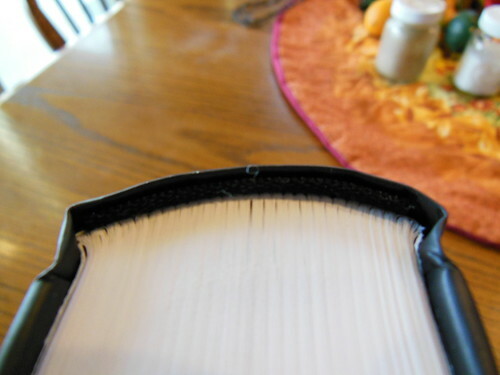 You can see the signatures bend around it rather than the pages bending around a glued spine. 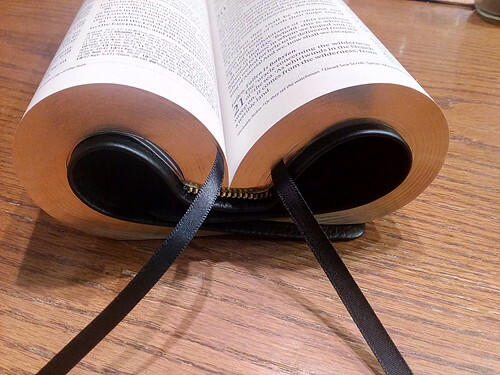 This is a, “must have” feature for a Bible. They should all have sewn spines. 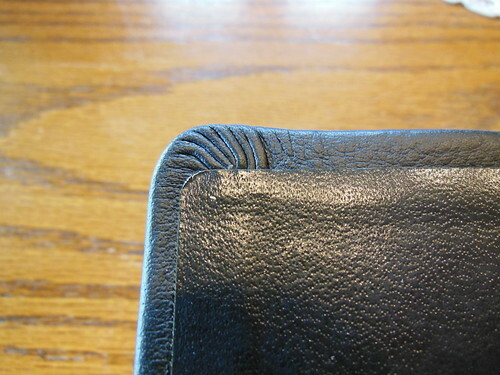 I wouldn’t even purchase a value line Bible without a sewn spine unless I had to. 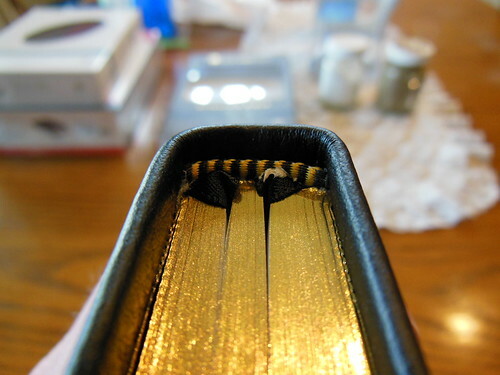 The sewn spine is a major factor in how long the Bible will last and how well it will open and lay flat. 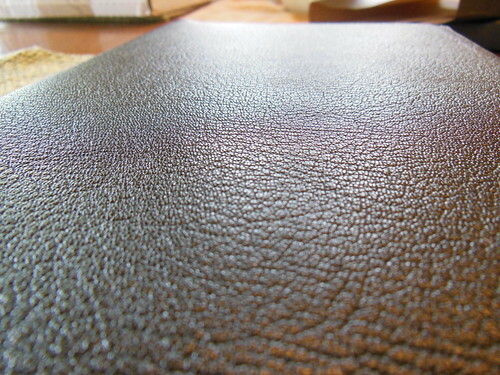 As you can see from the pictures, the cover is supple and has a lovely textured grain to it. It is a pleasure to hold. The light weight and dimensions of the Omega equate to hours of easy reading, as well as long evenings of deep study. 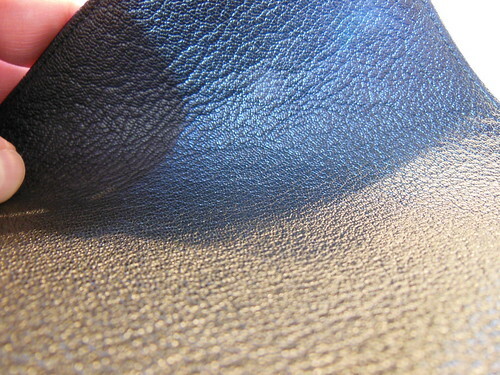 You can see the lovely grain of the leather in this close up picture. The corners of the cover are very well executed as are the corners of the text block. They have been rounded, as well as the spine. 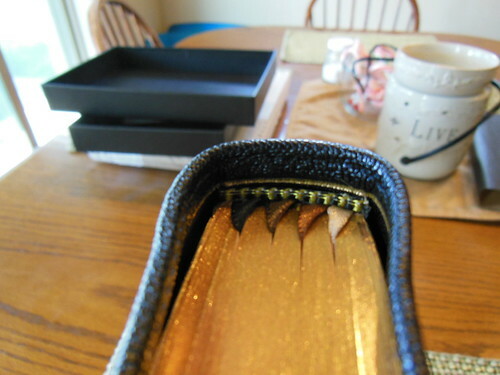 The page edges are beautifully art gilt. Also, take note of the use of four ribbon markers. That is almost unheard of. I know it is the first time I have heard of it, and I like it. The color of the ribbons is complimentary to the cover, and each other. I am actually using all four of them. 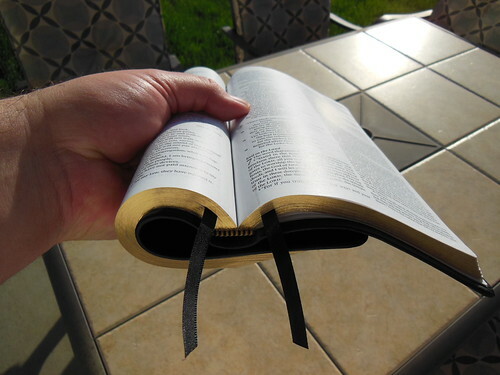 I use one for my Old Testament reading, one for the proverbs and devotional reading, one for my New Testament reading, and one to mark where I am at in my study with a couple of my brothers in Christ. 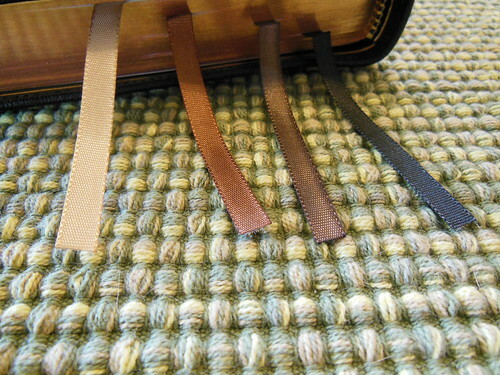 The gold and brown head and tail bands match the ribbons and inner liner. The spine is decorated with four raised hubs. 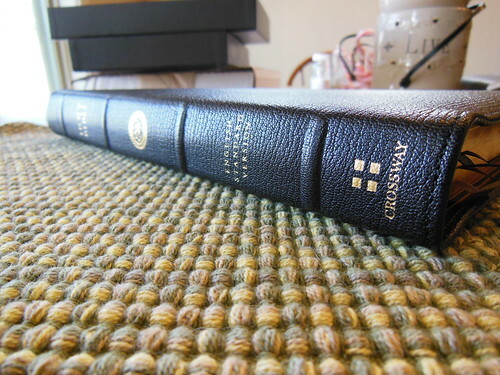 It has, “Holy Bible” at the head, the ESV logo, “English Standard Version” above the foot, where the Crossway logo sits, all hot stamped into the goatskin leather. 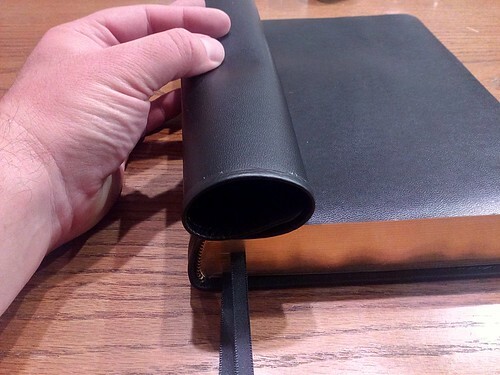 The text block is joined to the cover like all edge lined Bibles, by gluing the leather tab from the inner liner to the block and then covering it with a vinyl coated card paper. This one is glued further up the paper to make it more durable. At the front you’ll find a presentation page and some family records pages. 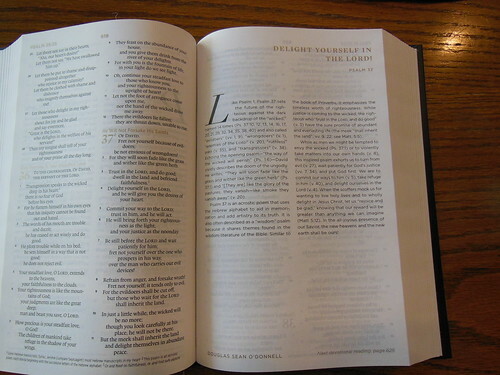 The Omega Heirloom Bible employs a 28gsm PDL paper that has a opacity rating of 79. The Omega uses a 10-pt. 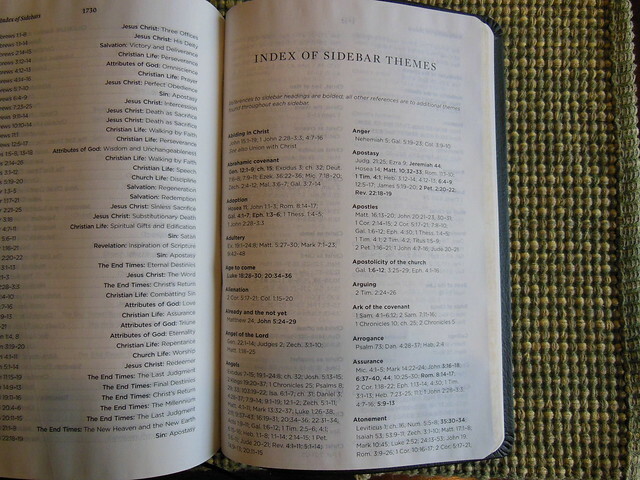 Lexicon font for the main text. With one page singled out and help up with light showing through from behind you can see how well the line matching was used. 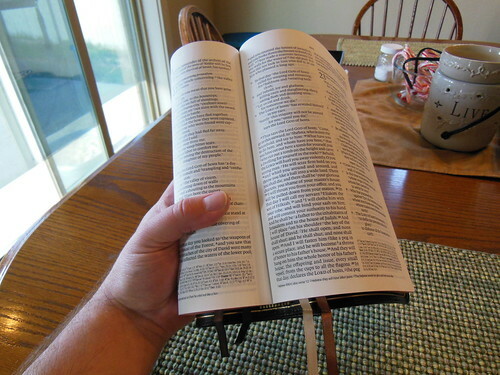 It is exceedingly effective in reducing eye strain, and making this Bible a pleasure to read. 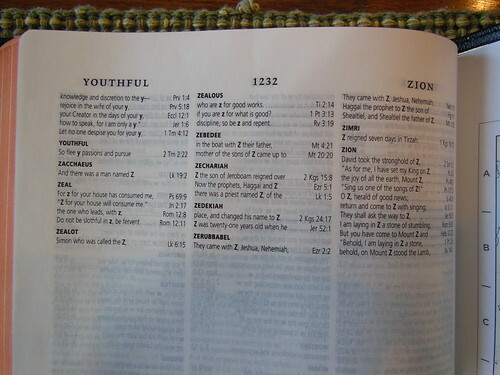 This coupled with the high quality print job that Jongbloed did makes this a most legible Bible. 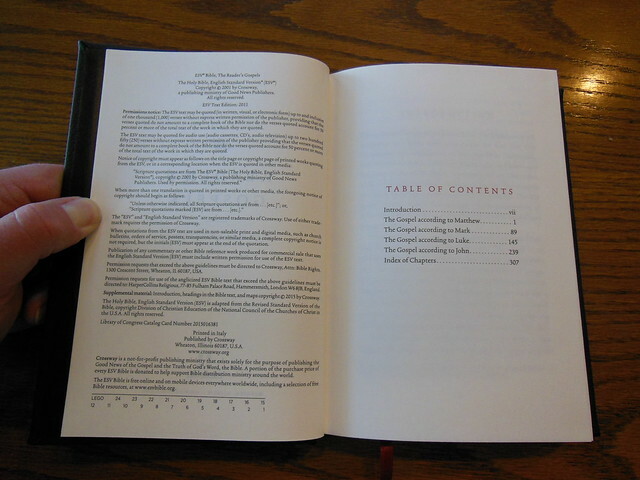 It is a double column, paragraph format layout with drop cap style numbers for the chapters. The book titles appear at the top of the first page of each book. Page numbers are placed at the top and justified to the center of the head. The text is some of the boldest I’ve seen and is very sharp. 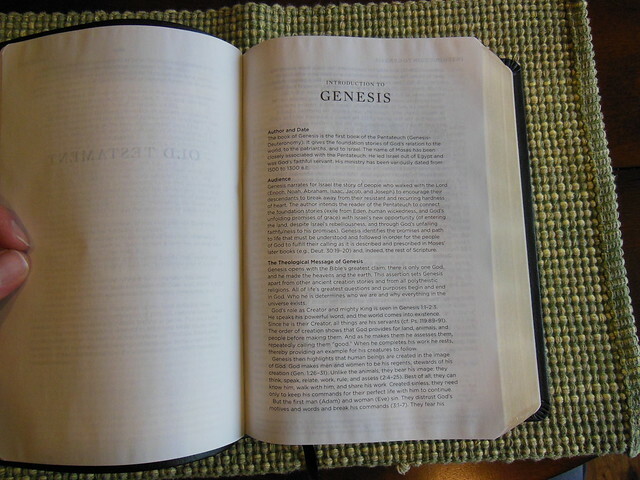 It contrasts well against the paper and also is a tremendous feature making the Omega a great Bible. 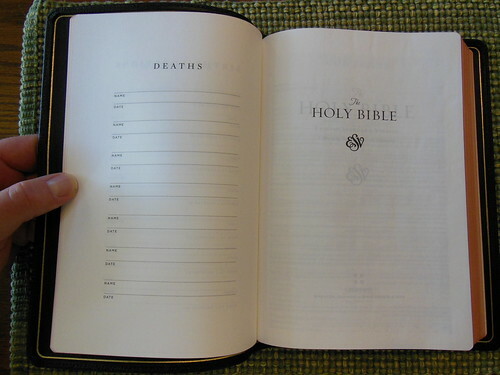 To make space for the text, the cross references and notes are printed at the bottom of the page. This layout is becoming more and more popular because of its effect on text real estate on the page. 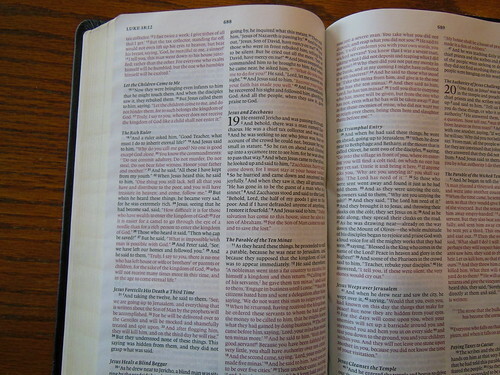 As you’ve come to expect on premium Bibles, the page edges are art gilt with red under gold. 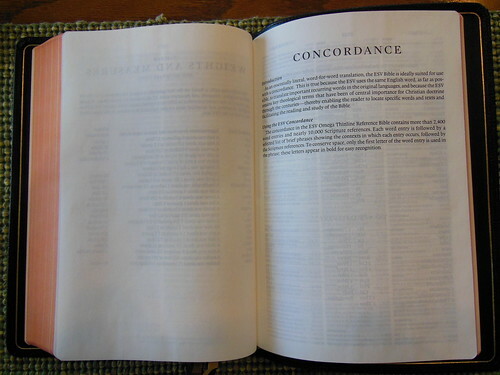 There is a useful 41 page, 3 column concordance in the back of the Omega. Make sure to take advantage of it. It can be a helpful tool. 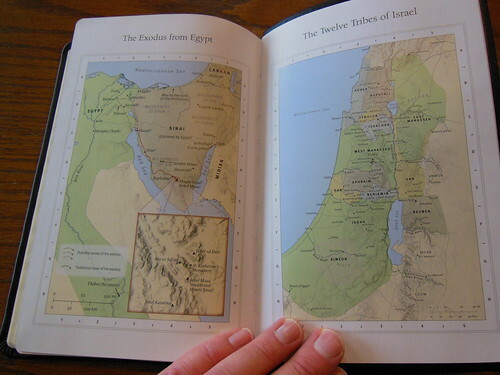 You’ll find the obligatory maps from Crossway in the back. Their’s are some of the best. 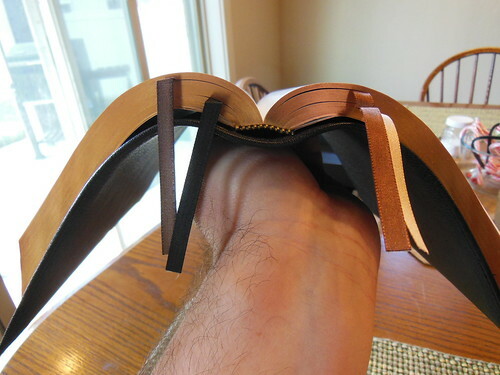 With the sewn spine, and edge lined binding this Bible is nice and flexible. Notice how well it drapes over my hand. Here it is compared to my R. L. Allan NASB Reader’s Edition. The Omega is a bit shorter, thinner, and more narrow. It is much easier for me to handle than the Allan. 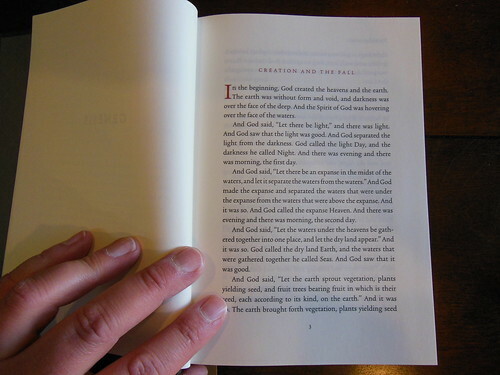 Below you’ll see on the left a page from the Omega, and on the right the Allan. The Allan doesn’t use line matching. Even though it is a great paper, there still is a bit of ghosting. This makes the Omega the winner. 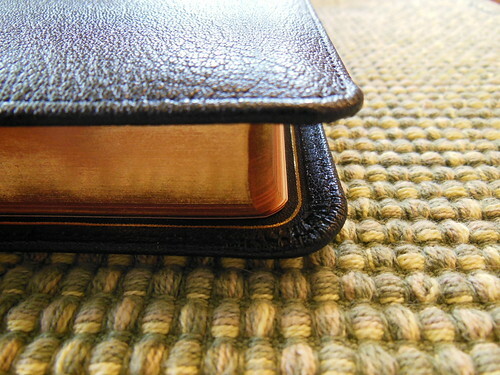 Here we have the Thinline Heirloom, Omega, and Study Bible from Crossway. 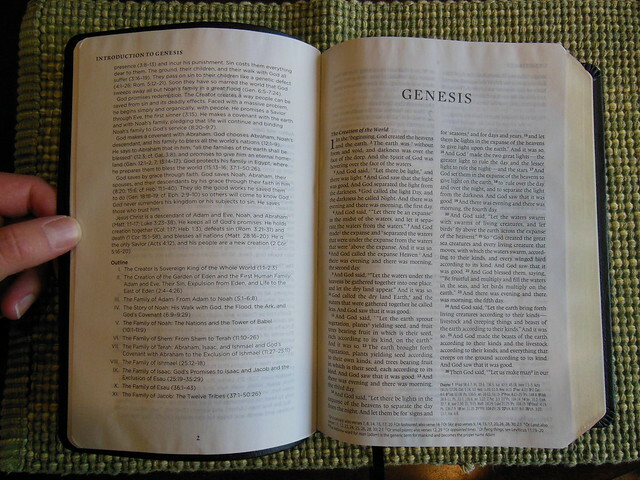 I think you’ll be very happy should you decide to purchase an Omega Reference Bible from Crossway. 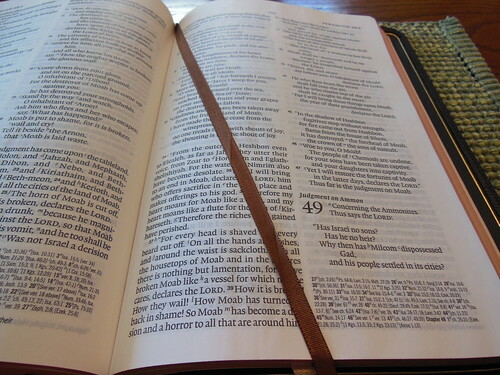 I don’t think there are very many Bibles out there that are any better. It is one of the best. 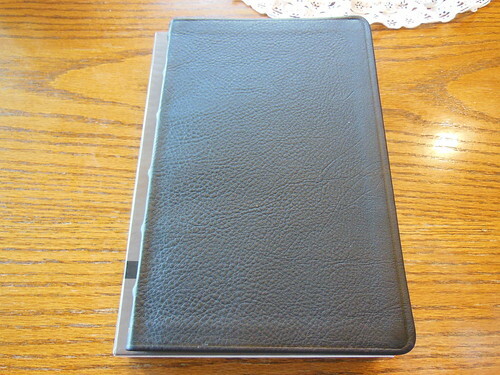 This Bible would make an excellent gift to a person graduating from seminary, a Preacher in your Church, or anyone who enjoys well built Bibles. Make sure to check out the rest of the pictures on my flickr page. 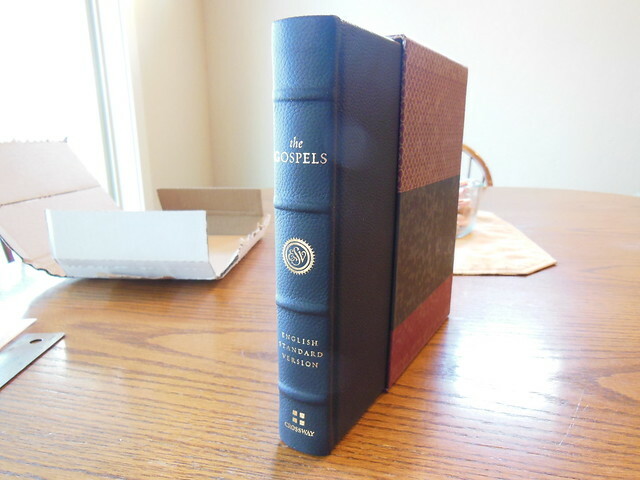 Alright folks, with the recent release of the ESV 6 volume Reader’s set, I thought you might like to read a review about this Reader’s edition of the Gospels. 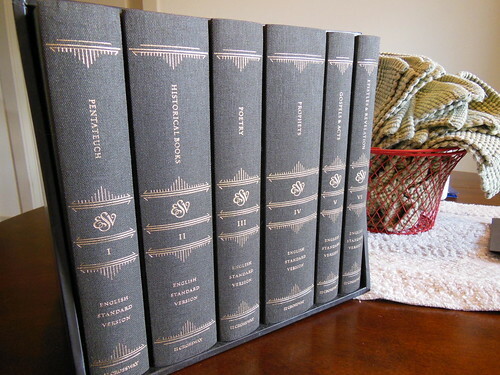 It would be a less expensive way for you to see if you want to shell out the bucks for the entire 6 volume set. Maybe you don’t want the entire set, just the gospels? Whatever the case may be, I offer this review up for your information and pleasure. The Reader’s edition is an interesting concept. 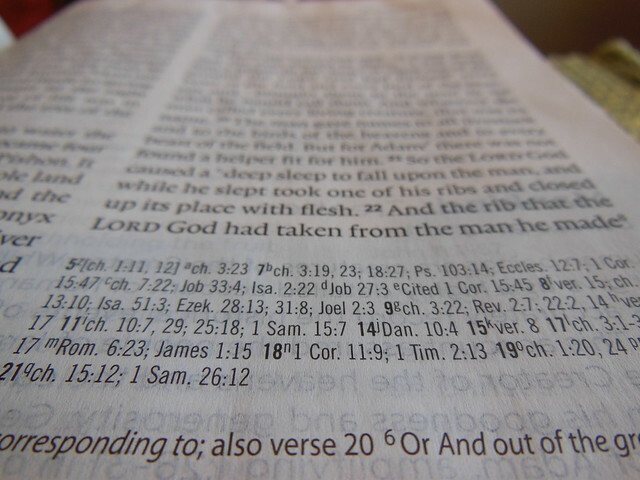 There are no chapter or verse numbers. There are no cross references or footnotes. The paragraph format is done according to where new paragraphs would start in English. The books are typically arranged other than that. 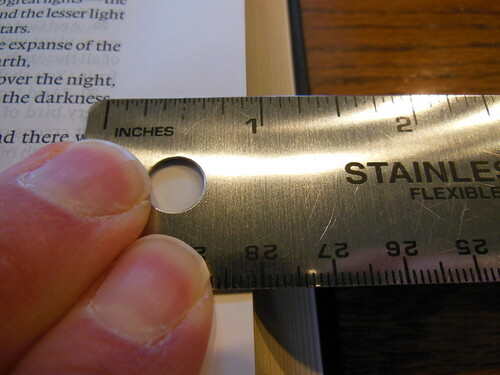 The only way to tell where you are in a book, is by using the index in the back in conjunction with the page numbers. All of this is to accomplish the mission of a reader’s edition, to remove obstacles or impediments for the reader. I find that as I read, I lose track of my progress. I tend to read more in this volume. 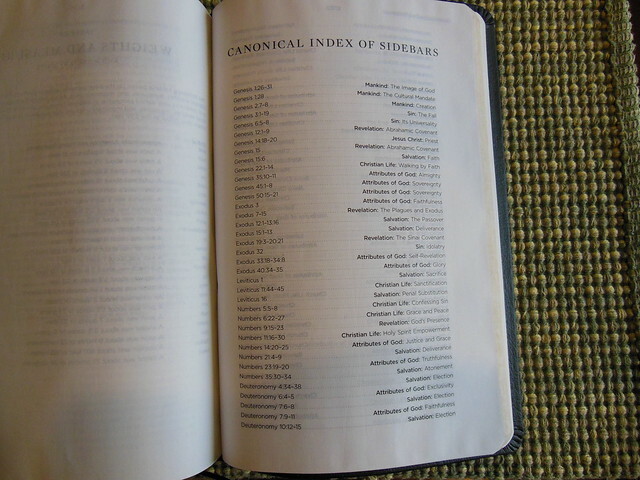 Some of it is due to the lack of chapter and verse numbers, as well as the lack of cross references and footnotes. While some of the other design and layout features contribute to it as well. 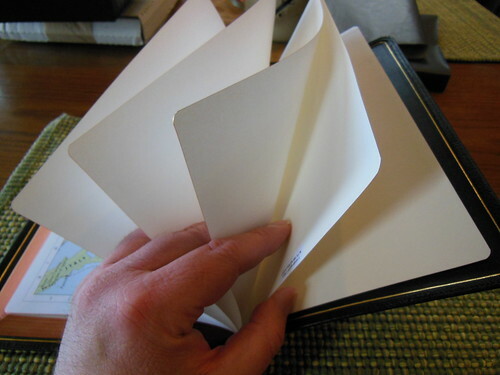 For instance, Crossway utilized a high quality, cream colored, uncoated, heavyweight paper more commonly seen in hardback novels. It is 80 g.s.m. and you can hardly see through it at all. The font is 12 pt. in size. It is sharp and clear. It is laid out in a single column. This edition is truly meant to be read through like a book. There is nothing in between you and the text. I could go on and list all of the cool features of this edition, and I will, but I want to make sure you understand what the point is. Reading and experiencing the gospels in a more fluid and retainable way was the goal, and Crossway achieved it. Bonus is that there is no eyestrain, or headache after a long reading session. So now that you know how accessible this makes the gospel, let’s look at some pictures and hear about some features of the construction. 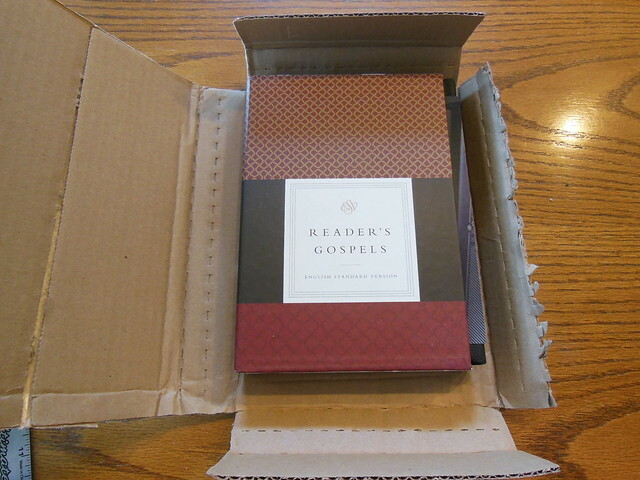 The Bible was shipped from Crossway, and well packaged. It arrived undamaged. This volume comes in a nice heavy slipcase. It is intended to be kept, and used for storing this volume in when not being used. 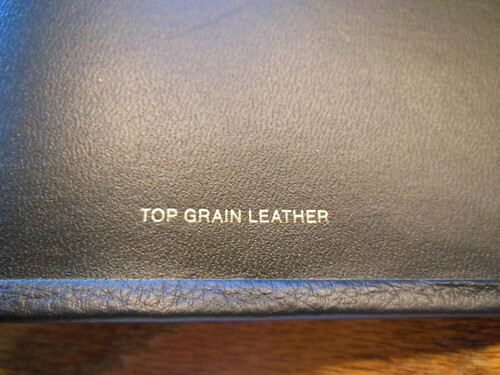 Once it is out of the box, the first thing you’ll notice is how soft the topgrain leather is. 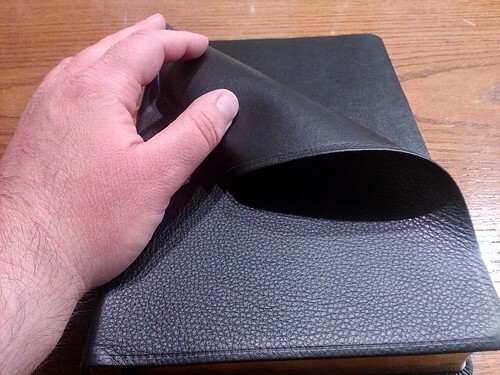 If you don’t like leather over board, or if you want a Reader’s edition with a smaller price tag while retaining the same text block, you could get it with cloth over board. Here is a good close up of the cover. 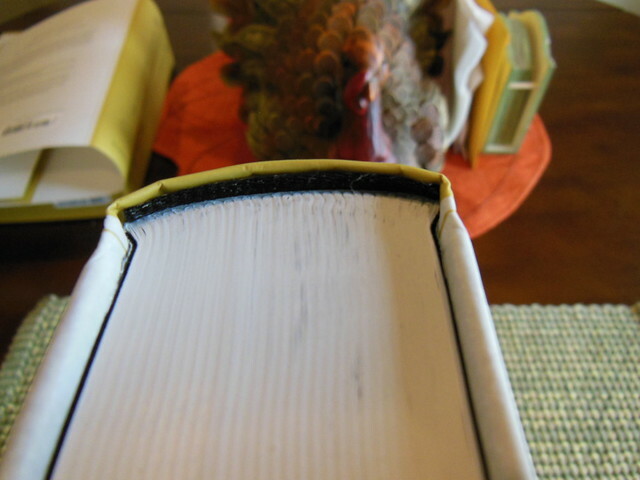 You’ll notice the page edges are not gilt. There are decorative head and tail bands in gold and black. 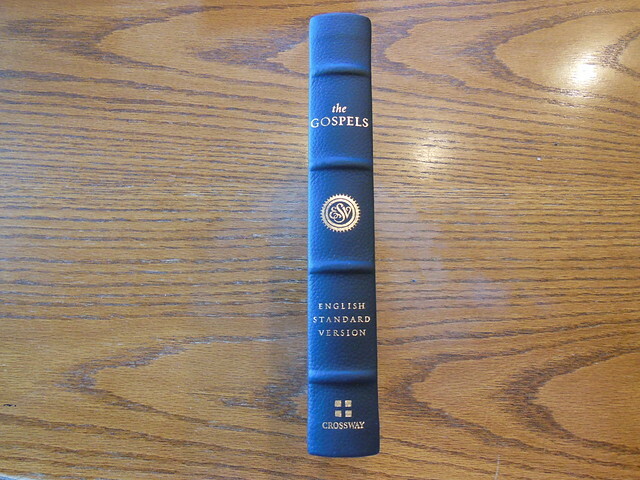 The spine has, “The Gospels” at the head, the ESV logo below that, “English Standard Version” after that, and the Crossway logo at the foot in gold. There are also four ornamental spine hubs. 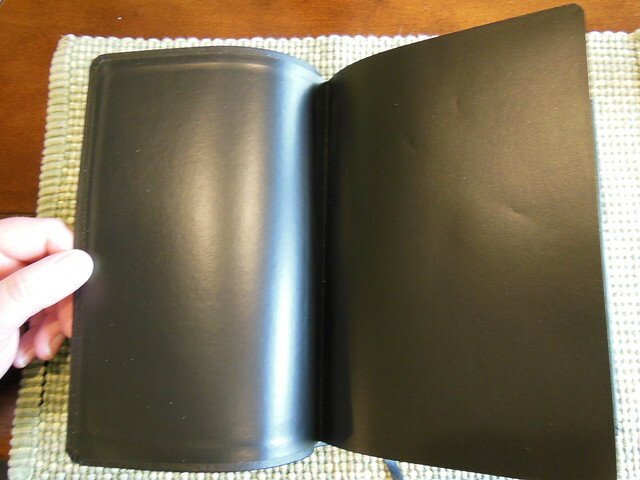 Here is a picture of the inside of this casebound hardcover. 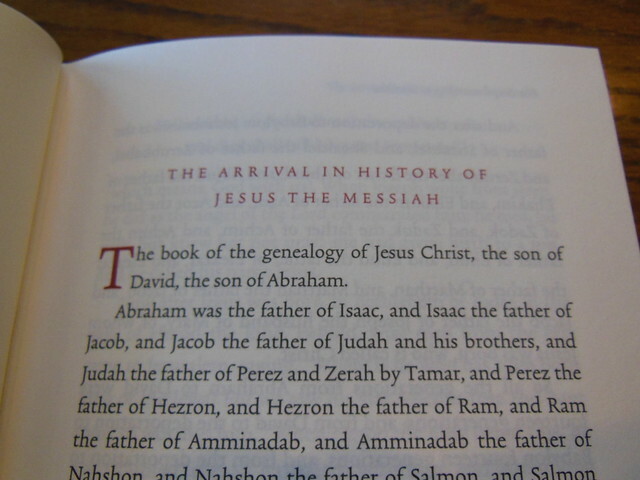 The book names, headings, and drop caps are printed in an appealing red text. I took a picture of one page, separate from the others, and with light behind it so you could see how thick and opaque it is. 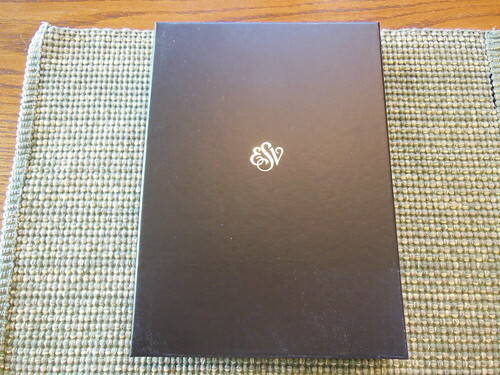 I’d never heard of Munken Premium Cream woodfree paper before, but after seeing it I’m sold. 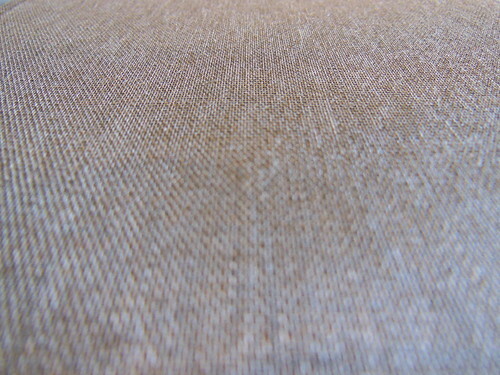 Here is another picture of the wonderful paper, 12 pt. font, and the crimson colored ribbon marker. From this picture you can also see the fat signatures with the ribbon laying on top of the page. 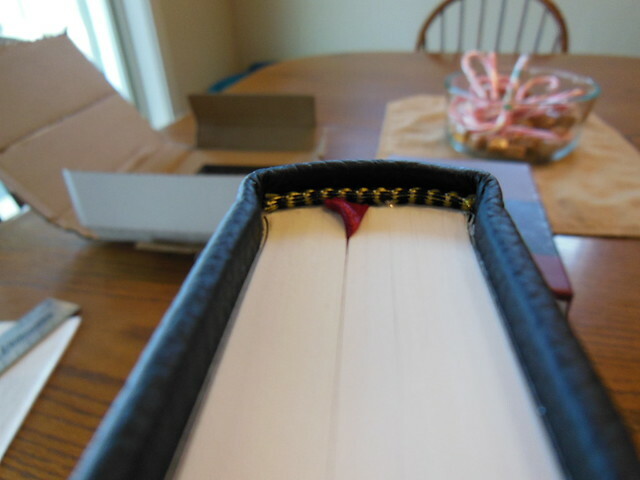 Of course, like you’d expect on a high quality book, the spine is sewn. 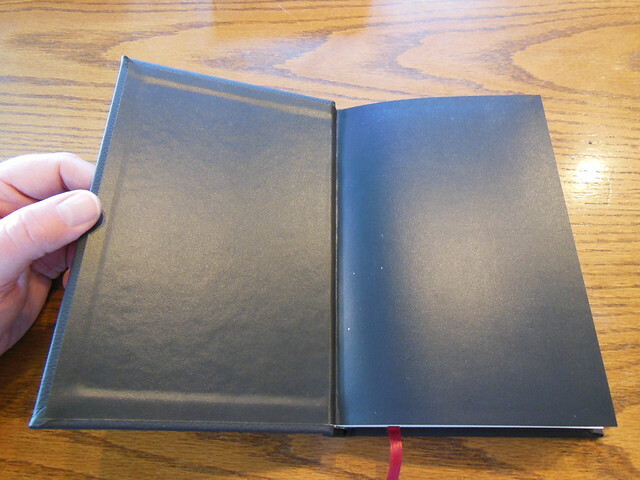 This ensures a durable, and useable binding. Of course my favorite picture is the one where I am reading it. After reading from this edition, I am eager to purchase the 6 volume set. I will probably get the cloth over board due to the price. I am looking at getting the new Schuyler Personal NASB Quentel when it comes out this year, so I have to save my money 🙂 That way I can get both. I would highly recommend getting this for anyone wanting to try a reader’s edition out. It is one thing to know the concept, but another to live with it for a while. Make sure to look at the rest of the pictures I took of this edition on my flikr page. 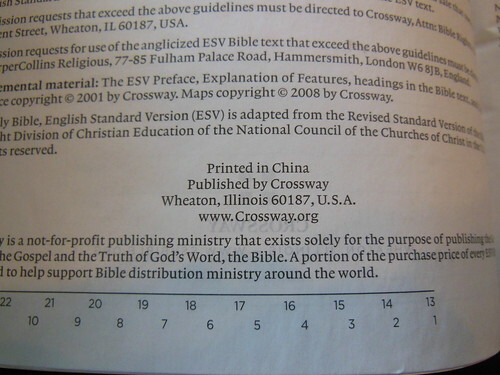 You can also read about more of the details on Crossway’s product page. You can purchase your copy at Christianbook or Amazon. 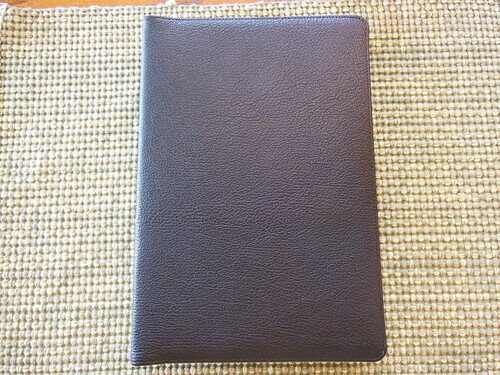 I purchased this Bible on sale from Christianbook.com I was curious because it was listed as having a top grain leather cover. I was glad I ordered it. It turns out that it is now out of print. So if you can find one, I suggest you purchase it. 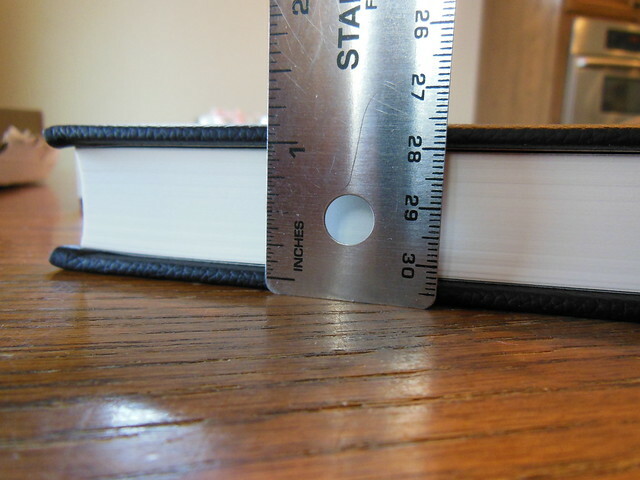 I was pleasantly surprised by this less than a half inch thick little gem. 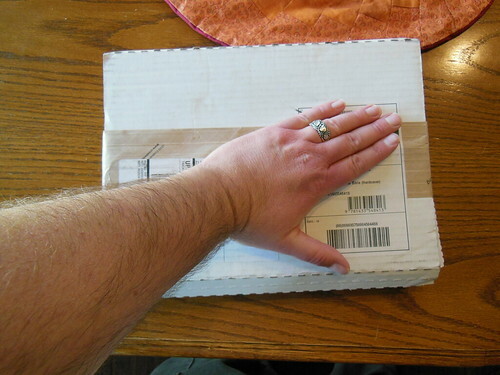 This UltraThin came in a clamshell retail box with a clear plastic window. I retained the box for storage purposes. Once you open the box up you smell the leather and not glue or dye. 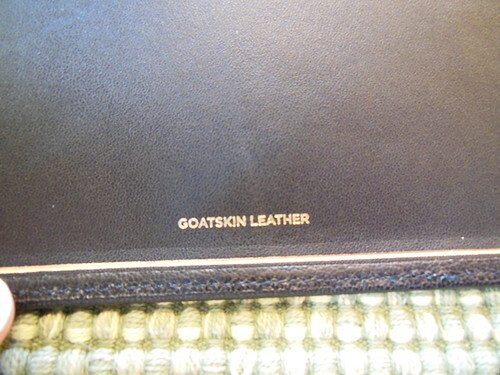 The leather was very supple and soft to the touch. The grain appears to be natural. There is a nice perimeter groove and spine hubs. 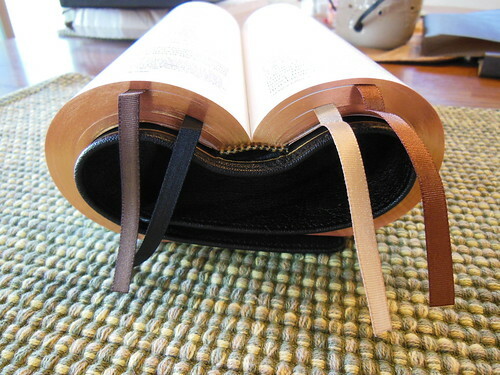 The spine is sewn affording this very thin Bible with great flexibility for a paste down, case bound Bible. In my opinion the cover offers a perfect compromise of flexibility, and structure. 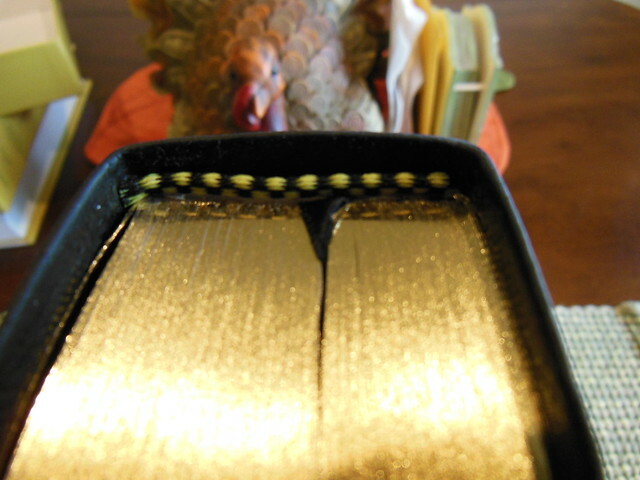 The head and tail bands are gold and black, complementing the color of the cover, and the gold page edge gilt. There are two ribbon markers, even though the retail site only lists one. 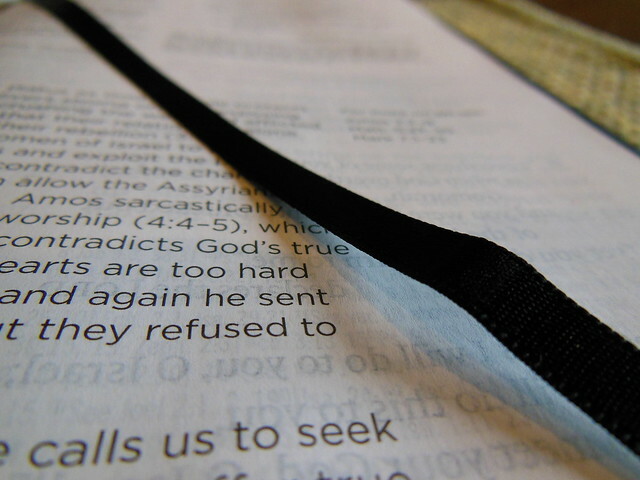 The ribbon markers are narrow, but thicker than most employed in Bibles under $100. 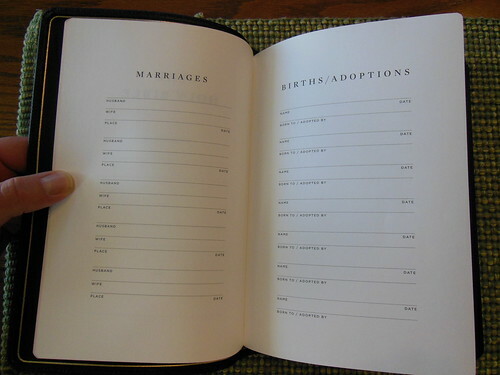 In the front of the Bible there is a presentation, marriages, births/adoptions, and deaths pages. They are printed on a thicker matte finish paper that takes ink well. Unlike higher gloss papers, these won’t crack or tear as easily. 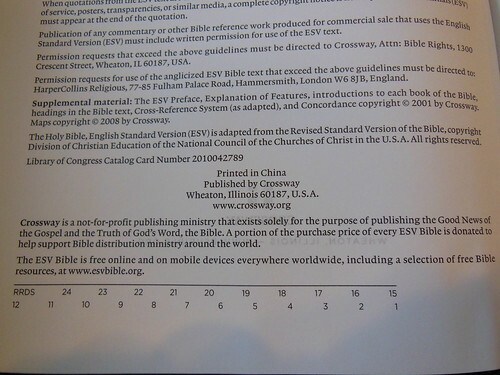 Then there is the copyright/publishers page. 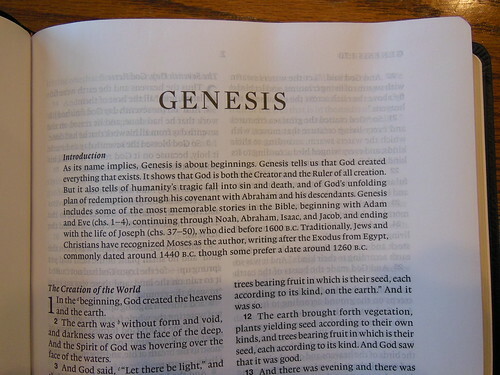 Before Genesis begins the Old Testament we have the table of contents, preface, and explanation of features. 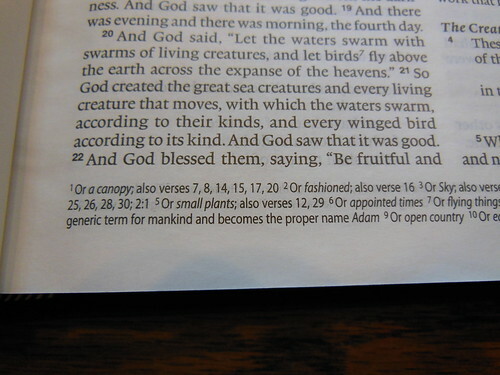 The text of this Bible is double column, paragraph format. 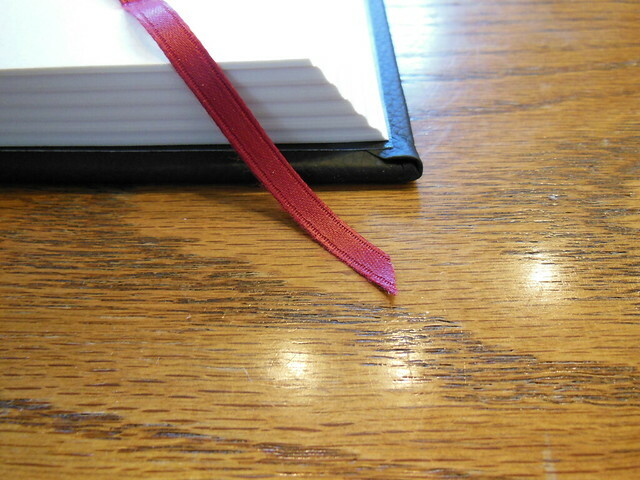 This is a red letter edition. The red lettering is not too red or too light. It contrasts well against the white paper and surrounding black text. The main text is a 7.5 pt. lexicon font. Line matching is employed to aid in reduction of, “ghosting” or the appearance of the text from the opposite side of the page showing through the paper due to the opacity allowing it. 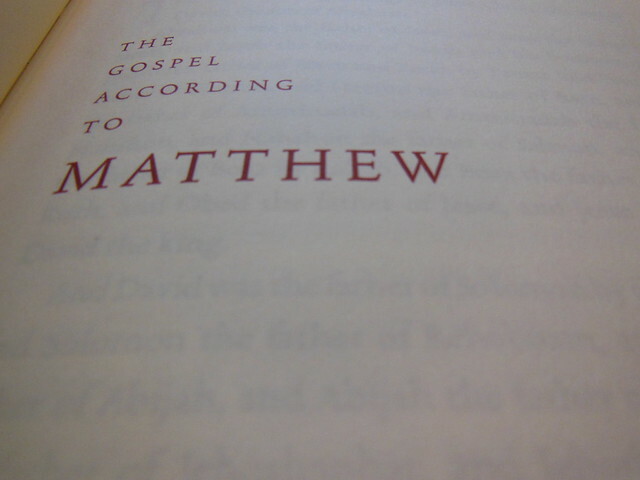 The paper’s opacity is pretty good considering how thin this Bible is. At just under a half inch, it is one of the thinnest UltraThins I’ve seen. I had assumed that they used a thinner paper. That was not the case. The paper is 31 g.s.m. 20# Thincoat Max. 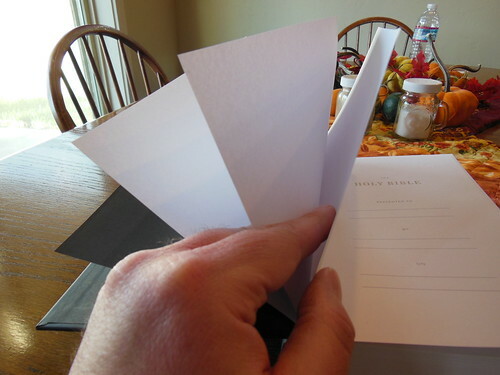 This is not a thin or lightweight paper. It looks like they made up for the thickness of the paper by not having any cross references. There are some footnotes at the bottom of the pages. This way they could fit the entire text into this UltraThin. 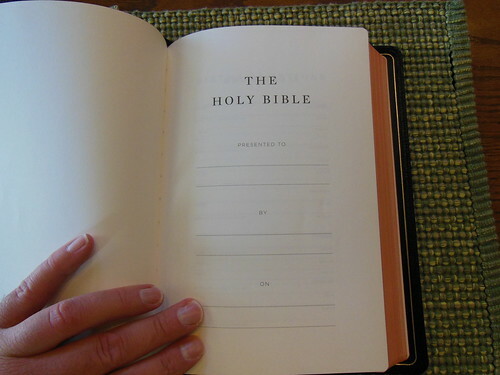 So we have a nice, legible, well printed, and bound Bible in this truly UltraThin format. 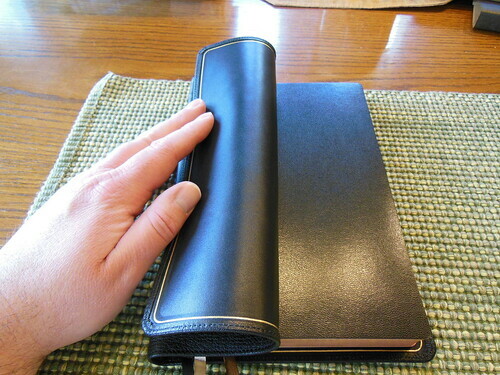 It is also so soft and flexible due to the quality binding and cover, that I can fold it over itself. It is almost as flexible as an edge-lined Bible. 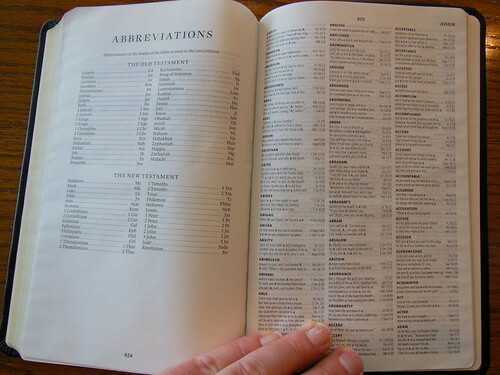 At the end there is a weights and measures page, and an abbreviations page. A three column concise concordance follows. Finished off with eight maps in color. 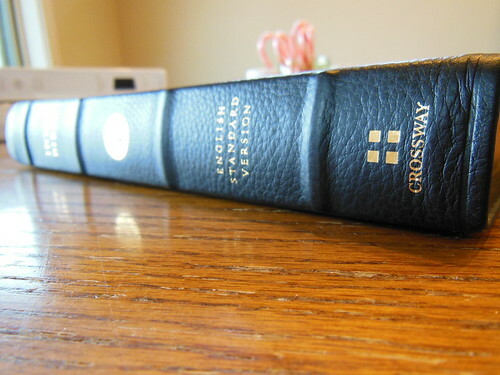 The Crossway, E.S.V. 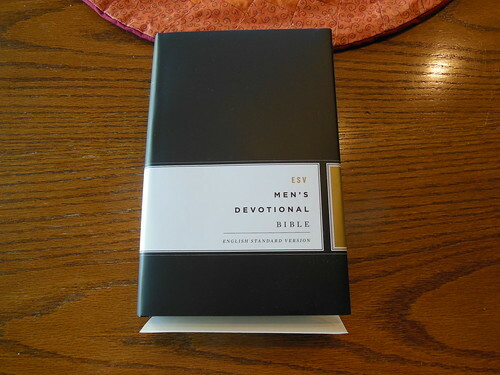 Men’s Devotional Bible, Not Your Typical Devotional Bible. If you’re like me, you steer clear of devotional Bibles. I have found that most of them offer very little in the way of useful or relevant information. Most of the time it is just happy, slappy, Osteenesque, self-help mumbo jumbo. Rather than aiding, it usually distracts and is discouraging. I wonder to myself, “Who could be helped by this nonsense?” Seriously, who writes this twaddle? It is not just men’s devotionals that suffer this malaise either. Women have the same nonsense foisted upon them, perhaps even worse. I was delighted to see that it far excelled the usual fare. No cotton candy, no fluff-n-stuff, no silly self help guru quotes, no Sarah Young extra-Biblical revelation, just sound exposition, and application. 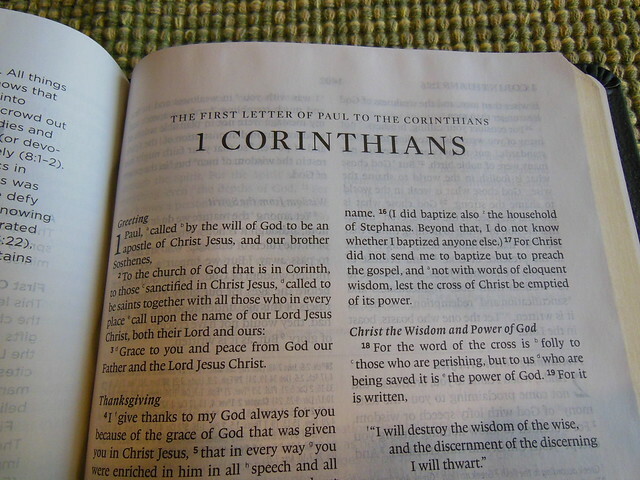 The devotional articles explain the text. They properly connect the heart and the head, as they engage both in a real, and valuable way. We are told in the Introduction that the goal was, “…for the heart to be strengthened by grace…” Hebrews 13:9. 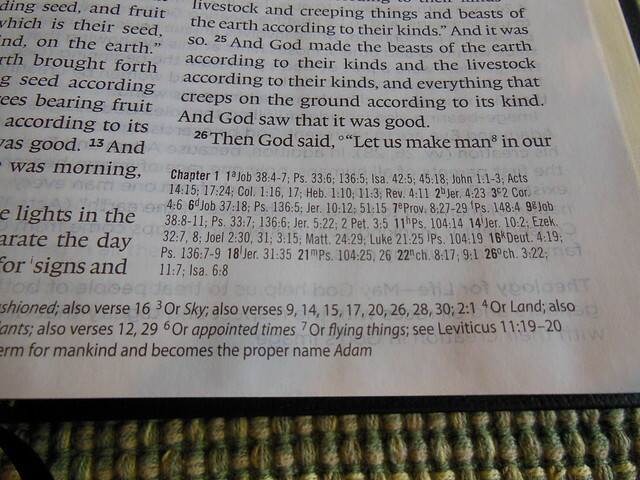 You might wonder what that means in the context of a Men’s devotional Bible. 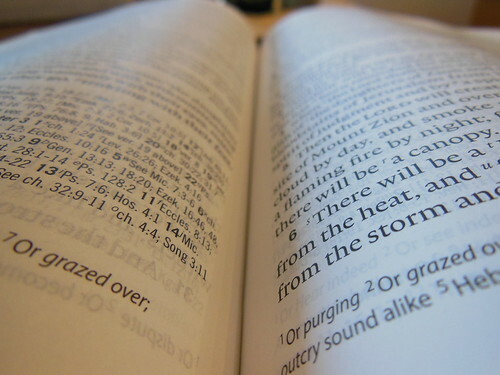 What it means is that the book introductions, devotional articles, and supplemental articles, are theologically accurate and connected to the text you are reading. All people have a theology. They perhaps don’t know it, but they do. Theology is important. Without accurately understanding who God is and who we are in relationship to Him, how would we know if we were worshipping the one true God or an idol we had constructed? These articles accomplish the goal of strengthening the heart by grace, through facilitating our learning Biblical truths. 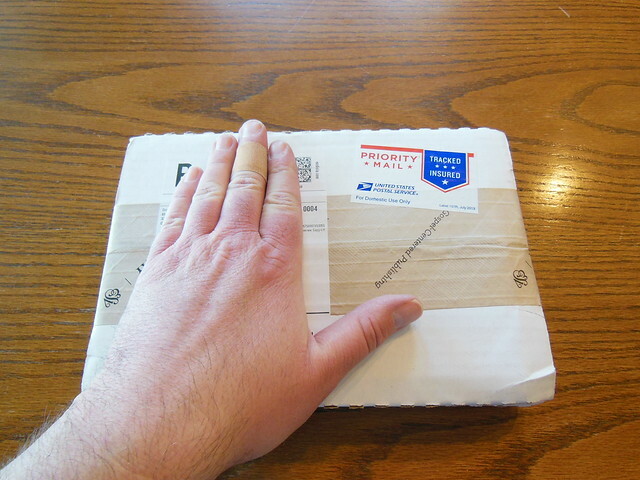 The Bible I was sent arrived undamaged. 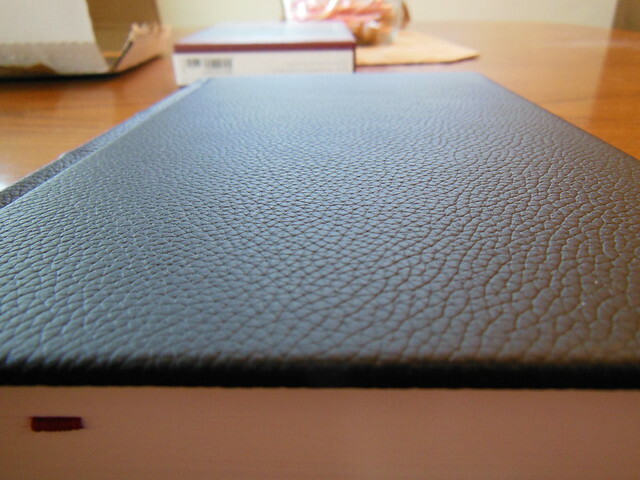 It was a hardback volume that is case bound. 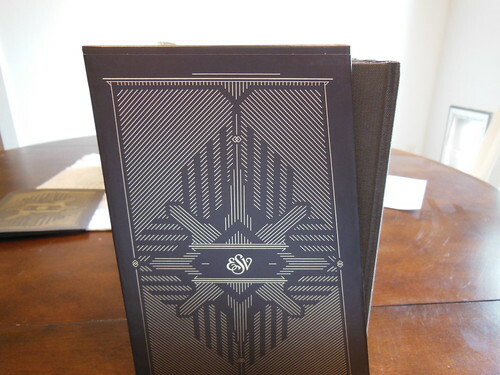 It included a dust jacket. 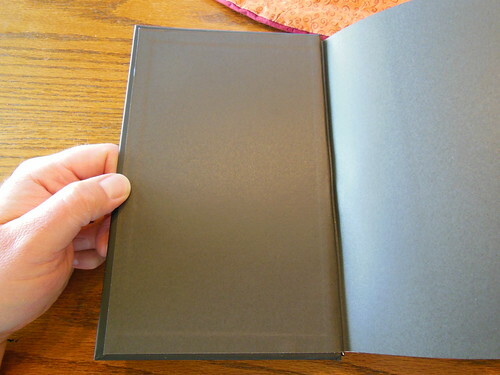 For those of you who have been reading my blog for a while, you know how I feel about dust jackets. (hint, I don’t like them. Completely a personal preference thing.) 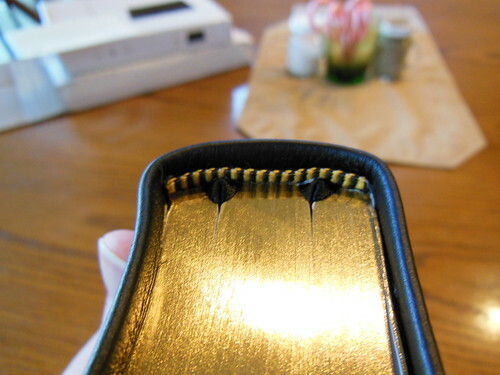 The spine is sewn to increase flexibility and durability. This, in my opinion is a necessity. 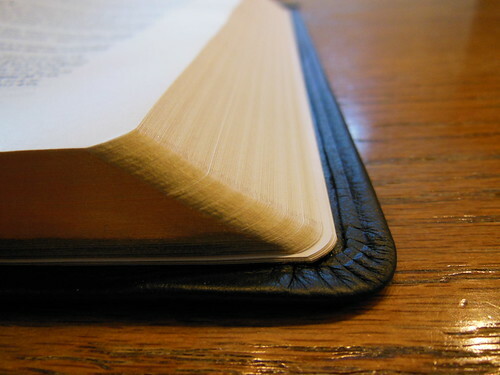 Glued bindings on a book that is meant to be used extensively are a horrible idea. Publishers that do that are only interested in selling cheap product to be replaced over and over. 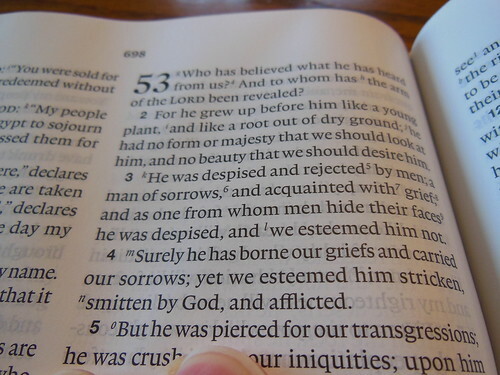 If you had to transfer your notes, underlines, and highlights, every 6 months to a new Bible, you’d be perturbed. 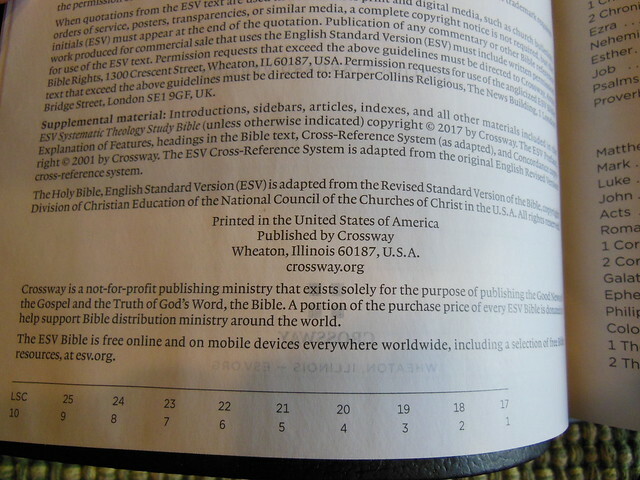 Thanks to Crossway’s experience as a Bible publisher, they know better. Usually when a publisher has work done in China the product quality begins to suffer. 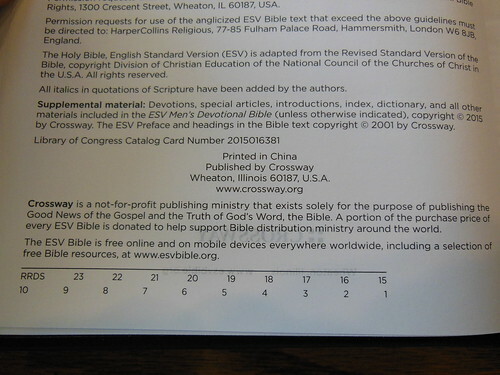 It seems Crossway has been able to keep the quality control standard high, while having this Bible printed and bound in China. 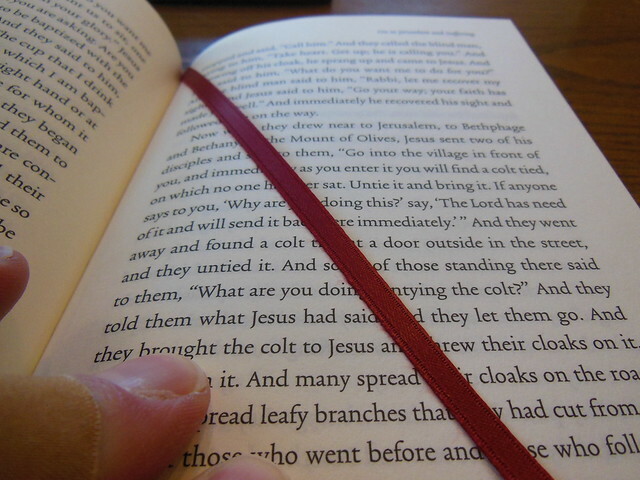 The hardback edition I was sent does not have any ribbon markers. 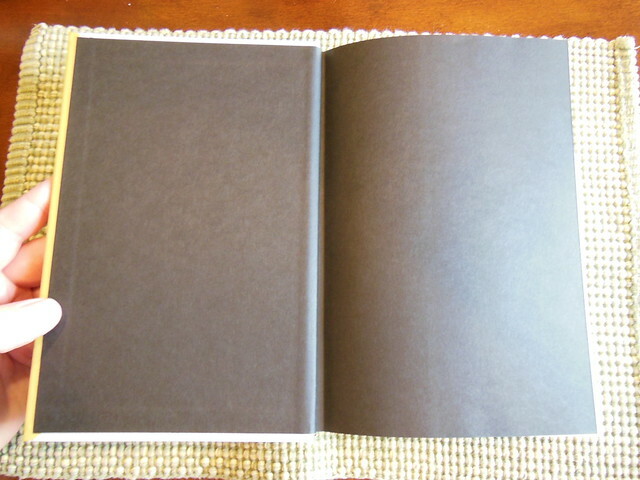 The cover matches the dust jacket in a satin finish, black color. 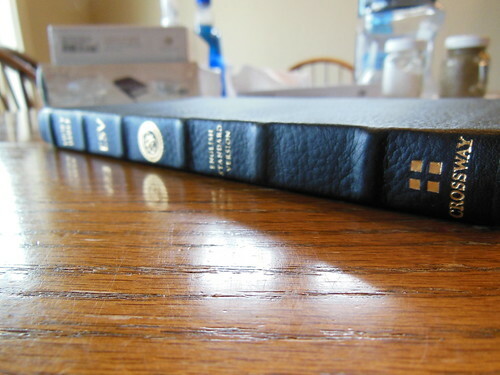 The only writing on the cover is on the spine where it says, “ESV Men’s Devotional Bible, Crossway” in gold print. The spine has been rounded. There are understated black decorative head and tail bands. 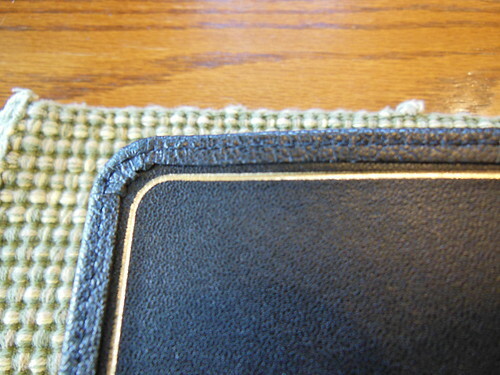 The page corners themselves have not been rounded and there is no page edge gilt. The inside paper liner matches the cover in color. There is one presentation page followed by a couple title pages and publishers information/copyright page. After that, there is the table of contents. 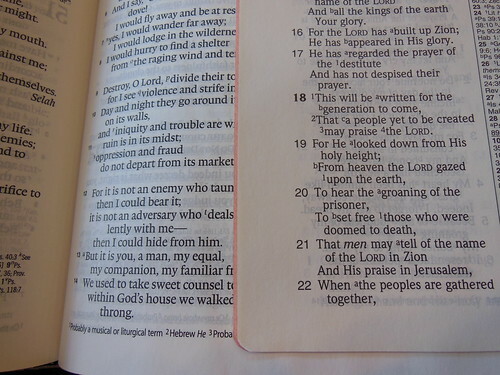 An interesting print feature in this Bible is the use of gold colored text for things like, titles, headings, chapter headings, and page numbers. It is and unassuming gold color, so it adds just the right amount of pop without glaringly drawing your attention away from the text. Drop caps are utilized at the beginning of each supplemental article. 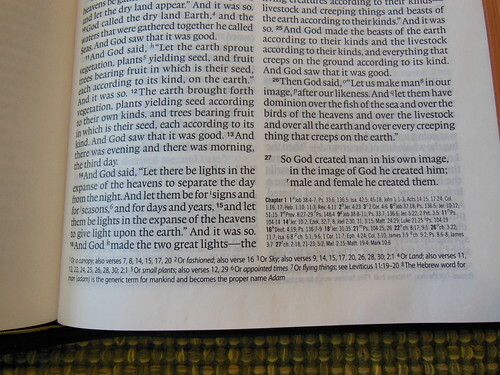 I found that this sets the article apart from the pages of Biblical text so you can spot them easily. 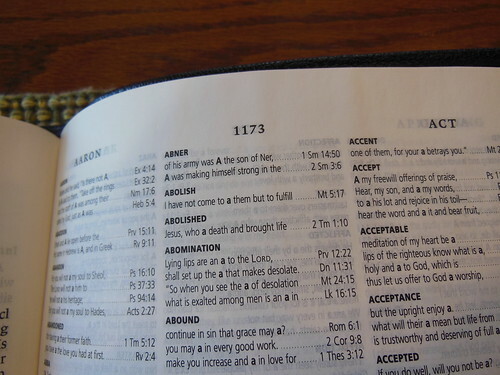 At the bottom of each devotion the page number of the next one is indicated. Since there are 365, a person could use them as a daily reading plan and read from one to the next daily. 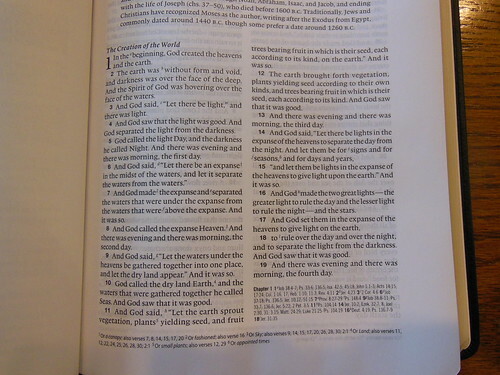 The Biblical text is arranged in a double column, paragraph format, in black text. 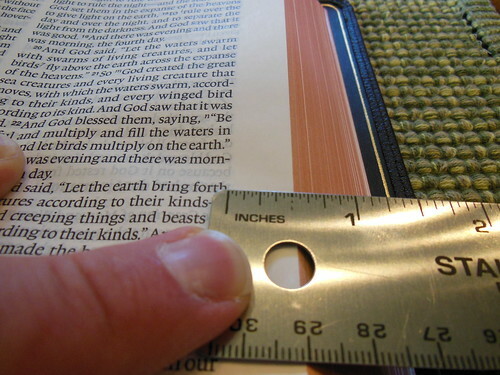 The text of the Bible is consistently inked and printed in an 8.5 pt. Lexicon font. 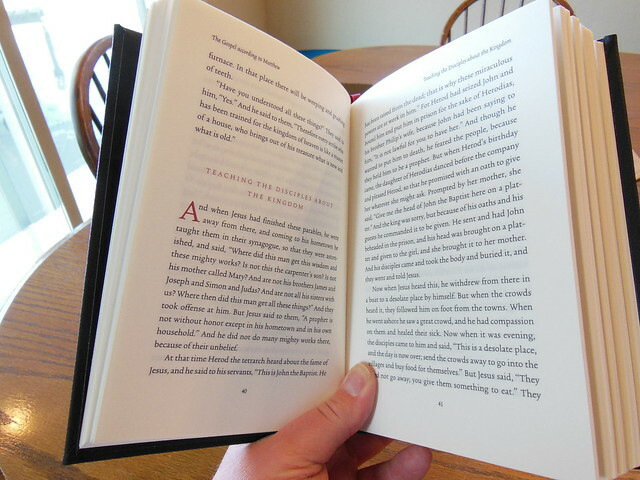 The devotionals are printed in a 7.5 pt. Gotham font. The text is dark black and contrasts nicely against the bright white, 36 g.s.m. paper, with an opacity rating of 83. Line matching was not employed however, the opacity of the paper is sufficient to limit the ghosting effect. There are no cross references and very limited footnotes. 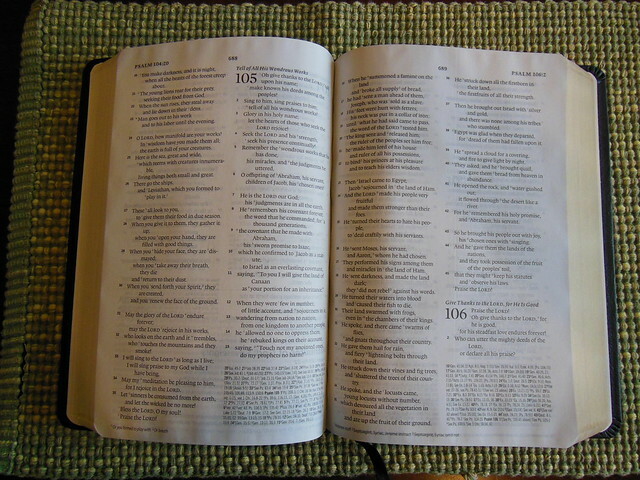 This is not intended to be used as a reference Bible or study Bible. 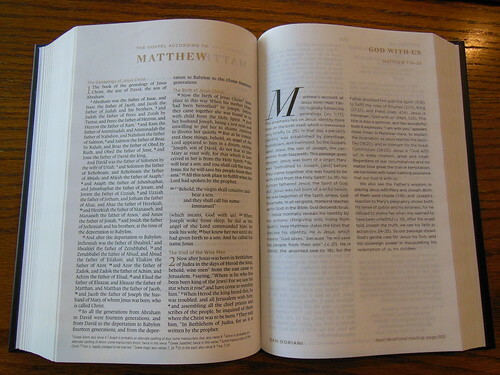 It adheres to the title of Devotional Bible very strictly. 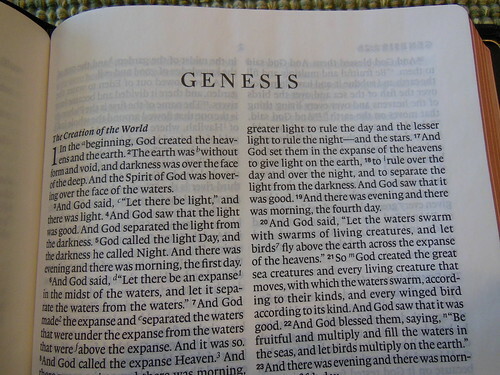 It far exceeds every devotional Bible I have ever read. 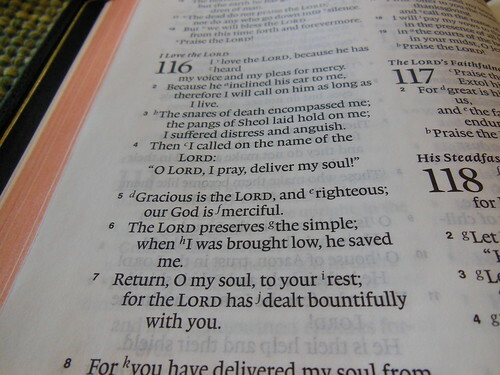 The devotions are gospel focused and faithful to the truths of God. I’ve included a list of the contributors. As you can see, with men of God like these, sharing their hard won knowledge and wisdom with us, we can be edified and encouraged. Don’t forget to check out the pictures on my flickr page.